​Zadrima (Zadrimë) je zemljopisna i etnografska regija u sjevernoj Albaniji, između Skadra (Shkodra) i Lješa (Lezha), Smjestila se u podnožju krajnjih jugoistočnih dijelova Dinarskog gorja, na prijelazu u Šarsko-pindski gorski sustav. Geološki, Šarsko-pindsko gorje je nastavak Dinarskog gorja koje dominira zapadnim dijelom Balkanskog poluotoka. Najveći dio regije Zadrime nalazi se u istoimenom polju Zadrima, koja se još naziva Fusha e Tejdrinit, koja je Donjeskadarske ravnice (Fusha e Nënshkodres), a koja je dio još veće albanske Zapadne obalne nizine (Ultësirën Bregdetare, odn. Ultësira Perëndimore e Shqipërisë ). Polje se smjestilo između starog toka rijeke Drin (Mali Drin=Drini i Vogël, Lješanski Drin=Drini e Lezhës) na zapadu, te planina Veles (Mali i Veles) i Hajmel na istoku (mali i Hajmelit). Sredinom polja teče rijeka Gjadër, pritok Drina. ​Kraj je bio dio kneževine Dukagjina (Principality of Dukagjini) u 15. stoljeću. Poznat po kulturnoj baštini, poznatim ljudima kojima je on postojbina, po zadrimskim tkaninama i lokalnom vinu Kallmet (Kallmet wine). Do danas je regija jako poljoprivredna. Od sela Kallmet, grožđe Kallmet, vjerojatno izvorna varijanta Kadarke i jedne od najznačajnijih albanskih vina, dobiva svoje ime. Preko Zadra vozi autocestom Lezha-Shkodra (SH1). Od svoje izgradnje neposredno nakon 2000. godine, prethodno nepristupačno područje je bolje razvijeno. Međutim, linija albanske željezničke pruge Hekurudha Shqiptare drži više na istočnom rubu aviona. Na zapadu je vojna zračna baza Gjadër albanskog ratnog zrakoplovstva. Das mehrheitlich katholische Gebiet ist Heimat vieler albanischer Kleriker wie (1606–1643), Lazër Mjeda (1869–1935) und dem bedeutenden Dichter Gjergj Fishta (1871–1940). Auf dem Burghügel von Sapa befand sich lange der Sitz des Bistums Sapa, bevor dieses nach Vau-Deja verlegt wurde. Bis heute ist die Region stark landwirtschaftlich geprägt. Vom Dorf Kallmet hat die Kallmet-Traube, vermutlich die Ursprungsvariante des Kadarka und eine der bedeutendsten albanischen Reben, ihren Namen. Quer durch die Zadrima verläuft die Schnellstraße Lezha–Shkodra (SH1). Seit ihrem Bau kurz nach dem Jahr 2000 ist die zuvor schwer zugängliche Region besser erschlossen. Die Linie der albanischen Eisenbahn Hekurudha Shqiptare hält sich hingegen mehr an den Ostrand der Ebene. Im Westen liegt der Militärflugplatz Gjadër der albanischen Luftstreitkräfte. Prema R. Elsiju ime Zadrima, slavenskog je porijekla i znači područje iza Drima. ELSIE, Robert: Historical Dictionary of Albania. str. 495. The Scarecrow Press, Lanham, 2004. Polje Zadrima je ravno i nisko područje, na 20-25 metara nadmorske visine, s nekoliko niskih brijegova visokih 80-100 metara. Na zapadu, u smjeru mora, nizinsko područje Zadrime je zatvoreno izduženim brdom Mali i Kakarriqit (392 m nadmorske visine). Od njegova sjeverozapadno ruba Mali i Barbulushit, prema sjeveru, nalazi se brijeg Bushat (249 m nadmorske visine) i drugi manji zaobljeni brijegovi. Na istoku Zdrime su planine velikog obalnog lanca, zapravo ogranci Skenderbeškog gorja (Vargmalet e Skënderbeut, odn kako se još naziva Zapadni rubni lanac (alb.Vargmalet Perëndimore)) s vrhovima Mali i Hajmlit, Maja e Shitës (614 m) i Mali i Velës (1170 m). Taj lanac se proteže u duljini od oko 80 km od Vau-Deja na sjeveru do Elbasana na jugu. Granicu Zadrime prema sjeveru čini današnji tok Drina, a na jugu je to gradsko područje Lješa, koji se nalazi nešto sjevernije od ušća Drina u more. Pogled s utvrde u Lješu prema sjeveroistoku, na planinu Mali i Velës. U Zadrimi se nalazi 40 sela, rasprostranjenih na 350 četvornih kilometara. Glavna naselja u Zadrimi su Gjadër, Dajç, Pistul, Shkjeza, Mjeda, Hajmal, Troshan i Kallmet. Većina naselja, poput malog sela Fishta, leži na rubu niskog dijela i izolirana grebenima u središtu ravnice. Administrativno pripada Skadarskom i Lješanskom distriktu (Shkodër, Lezhë), odn. njihovim općinama Vau-deja i Lezha. Ranije, do administrativnog preustroja Albanije (105. godine), komuna Bushat, Hajmel, Dajç i Blinisht, kao i okrug Vau-Deja činili su središnju regiju Zadrima. Zajedno je u ovih 5 zjaednica 2011. godine živjelo 34.000 stanovnika. Zadrima je dominantno katoličko područje, dom mnogih albanskih klerika kao što su Frang Bardhi (1606.-1643. ), Lazër Mjeda (1869.-1935.) i istaknuti pjesnik Gjergj Fishta (1871.-1940.). U utvrdi na brdu Sapa bilo je dugo vremena sjedište biskupije Sapa , prije no što je prebačena u Vau-Deju. Mortimer Sellers: The Rule of Law in Comparative Perspective. Springer. p. 207. Frang Bardhi (1606 1643), known in Latin as Franciscus Blancus and in Italian as Francesco Bianchi, was an early Albanian church figure and author of note. He was born in Kallmet in northern Albanian Zadrima region and studied theology in Italy. In 1636 he was appointed Bishop of Sapa and Sarda. Bardhi is remembered as the author of the first Albanian dictionary: 'Dictionarium latino-epiroticum', Rome 1635 (Latin-Epirotic dictionary), comprising 5,640 entries. From 1637 on, Frang Bardhi submitted reports in Italian and Latin to the Congregation of the Propaganda Fide in Rome which contain a mine of information about his diocese, about political developments, about Albanian customs and about the structure and position of the Catholic church in Ottoman-occupied Albania. Here is one of the nineteen reports and letters preserved. Description and information on the state of the bishopric and parish churches of the Diocese of Sapa, subjected to the tyranny of the Turks. Done by Frang Bardhi (Francesco Bianchi), bishop of the said church, for the Holy Congregation of the Propaganda Fide. Although the Holy Congregation has received information and reports in the past on the church in Sapa from some earlier bishops, missionaries and apostolic visitors, the present bishop, aware that the Holy Congregation was pleased by the various reports it received from different individuals and in order to fulfil his duties, is now presenting the following report containing notable and detailed matters. The church of Sapa, a region commonly known by the Albanians as Zadrima, has a circumference of 60 miles and is situated in the province of Albania under the most cruel rule of the Sultan. On its western edge, it is bordered by the diocese of the well fortified city of Scutari (Shkodra), and to the south by two high and long mountains bathed by the waves of the Ionian or Adriatic Sea. At the base of one of them is a fair harbour known as S. Gion di Medua (Shëngjin) in which boats, galleys and large ships are easily accommodated. To the east, it is bordered by the diocese of the city of Alessio (Lezha) across the Plochegion (Plaku Gjon / Old Man John) Bridge, which is below the large village of Blijnisti (Blinisht) and the lofty and large mountain of Veglia (Velja), in which one could mine great quantities of silver. From here it borders on the people of Diberri (Dibrra) up to Mount Ruen (Runa), which is situated above the territory of Spassi (Spas). The border then follows along the river Lumi to the great river Drino (Drin), up to Mount Golijeia (Galija), and then down along the said Drin. To the north it borders on the peoples of Pulati (Pult) and Posterrippa (Postriba). These are the borders of the Bishopric of Zadrima, which is composed of five parts, being Zadrima, Sardania (Shurdhah), Puucha (Puka), Ibbaleia (Iballja) and the territory of Spas. 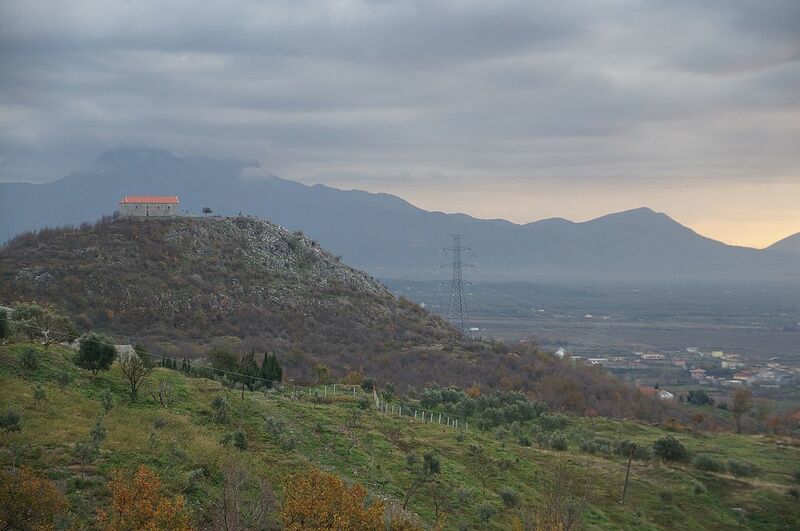 The last three parts are situated in the mountains of Ducagini (Dukagjini), about which the bishop submitted a diligent report to the Holy Congregation, having visited it over the past years. It may be consulted if necessary, because it contains the numbers of homes and souls, etc. 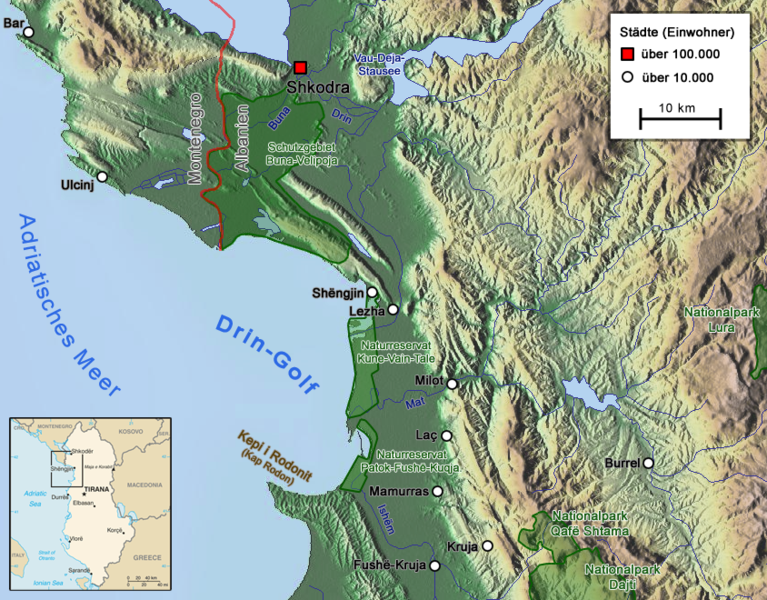 Shurdhah is a town which was destroyed by the Gallo Greeks at the fall of the Roman Empire, as Marinus Barletius reports in his account of the life of the invincible Lord Scanderbeg. One can, however, still see its walls, three paces high, which were built on a high hill over the banks of the Drin. One can also see that there were over eighty churches there. Now there is only one, built in our times and roofed with tiles by the faithful who hasten to it to receive the holy sacraments at the invocation of the Virgin of the Assumption. It is a parish church. It is thought that the Most Eminent Cardinal Barrosio, where he speaks in his church annals about the Council of Sardicensis, held in the year 347 and attended by 370 bishops, was referring to this town of Shurdhah. There are three little villages which hasten to this said parish church to receive the holy sacraments from the parish priest called Giorgio Scoppi (Gjergj Sopi). These are the village of Vierda (Vjerdha) with 19 houses on this side of the Drin, and the villages of Maserecu (Mazrek), Scelacu (Shllak), Guosta and others of 6 - 7 houses on the other side of the river. They have their own little church, which is entirely destroyed, and have nowhere to celebrate mass. All together, the aforementioned villages have 360 faithful souls to whom the said priest Sopi tends. These little villages are commonly known as Postriba and, for short, are called the population of the town of Driuasto (Drisht). From this side of the Drin, near to the said Shurdhah, there is a little village of five houses called Sporognite (Shpor). The bishop went there on a visit in June of last year to offer his services to the said population of Drisht when a Turk, the savage brave of the Turkish ruler of Shkodra, not only insulted him with offensive and crude words, but also, with no pretext except for having been told why the bishop had come to that village, raised his hand against him, holding in it a bare sword to cut the bishop's arm off. The poor bishop, foreseeing the terrible and barbaric blow, managed in his confu-sion to protect himself with his cloak, but was nonetheless injured in the left hand. When he shouted for assistance, one of his priests rushed up to him as did many men and women, who begged the Turk to desist from striking the bishop. But the more they entreated the savage to desist, the wilder he became. He escaped from their hands and once again struck the poor bishop on the back with his bare sword in hand, which he had brandished to slay him. The bishop then took refuge in a poor and run down cottage. The barbarian, swiftly breaking down the door, raised his arm with the very sharp 'blade of his sword to cut the bishop's head off. Seeing the extreme peril he was in, the bishop protected himself against the blow with a stool. Then once again, the people, who had been dumbfounded, rushed in. The poor bishop was obliged to flee for his life and ran as best as he was able down through the stony mountain crags to the banks of the Drin where, praise be to God, he came upon a Christian who set him on a raft without delay and took him over to the other side of the Drin. He was half dead from the cruel treatment he had suffered from the savage barbarian, and was dishevelled and scarred from having run on foot through the rocks and thorns. And as if this were not enough, he was pursued all the way down to the Drin. Not being able to find the bishop, the barbarian let off a shot from his arquebus, from which God in his mercy protected him. He was thus obliged to abandon the visit he had begun because the Turk, besides all the evil he had done, also stole his horse, his robes for mass and everything he needed for the journey. In addition, he broke the horse's saddle which the poor bishop was obliged to replace with money, together with all the other things. Such is the terrible state of woe in which the poor bishops of Albania find themselves. But let us return to our own affairs. When the town of Shurdhah was destroyed and its jurisdiction was reduced to so few souls, it was united at a very early time with the Church of Sapa. The fifth part, which is the main support for the Church of Sapa, is Zadrima where they have their see and where the bishops of this see have always resided. The cathedral church of the Archangel Saint Michael is situated on a large and high mountain. 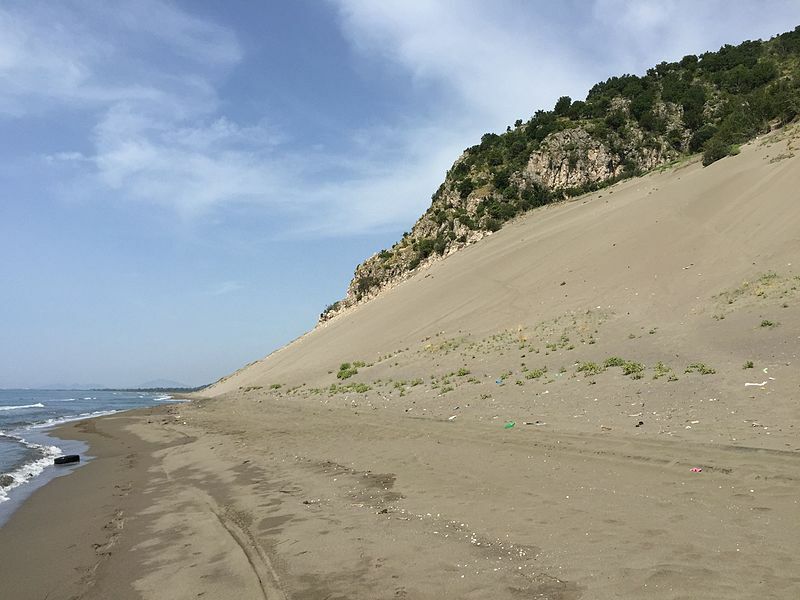 Before Sultan Mehmet, the emperor of the Turks, seized Albania, this site, being very well fortified, was inhabited by the famed lords of Dukagjini, i.e. Lord Paul Dukagjini the elder and his sons, Nicholas Dukagjini, Leka Dukagjini, Proghen Dukagjini and Stephen Dukagjini, who at that time were the legitimate and natural lords of Zadrima and of the aforementioned mountains of Puka, Iballja and Spas. The second last one turned Turk and became Pasha of Dukagjini. Together with these lords of Dukagjini who, with the exception of Proghen, were all good Catholics, lived the bishop of Zadrima in his own quarters near the aforementioned cathedral. In the general recollection of all the people of Zadrima, the bishops of Zadrima resided for some time in a poor village in the middle of Zadrima in order to better serve the needs of the poor Christian faithful there, who were being persecuted by the infidels. For the last eighty years, the bishops of Zadrima have been using for their cathedral the parish church of Saint George within the walls of the town of Sapa. This town was also destroyed, probably by the Romans during their war with Pyrrhus, king of the Epirotes, i.e. the Albanians. There are no houses within the walls, only the said church of Saint George on the top of the hill. Behind it, a bit lower on the north side, there are two little vicarages, built as residences for the bishops by George Bianchi (Gjergj Bardhi), the predecessor of the present bishop of Zadrima, but with the financial assistance of the people of Zadrima. They are situated one mile away from the ancient cathedral. Around Sapa, there is a large open town of eighty faithful homes and of twenty infidel homes. In Epirotic (Albanian), this town is known as Ndenscati (Nënshat), meaning 'under Sapa' (1), from which derives the title of the bishop, Bishop of Sapatensis. It is known for certain that four bishops come from this village: George Summa (Gjergj Suma), Tosolo Bianchi (Tozol Bardhi), Nicholas Bianchi (Nikollë Bardhi) and the afore-mentioned Gjergj Bardhi, now Archbishop of Bar. The last three made great efforts to rule and to protect the Christian faithful from the impiety of the Muslims over the last ninety years, right up to the present bishop, Francis Bianchi (Frang Bardhi), their relation and successor. The family and lineage of the Bardhis is considered noble in Albania. The aforementioned faithful families of the village of Nënshat, comprising 1,800 Christian souls, render to father Stephen (a man of exemplary conduct, who has taken care of the souls of the said parish of Saint George for the last twenty five years) as their tithe a value of seventy reals of wheat, millet, wine and daily alms, which are the produce of the bit of land belonging to this church. Since the parish priest is alone in his duties and since there is no way to support two parish priests, he is assisted by the bishop in giving the holy sacraments to these souls. 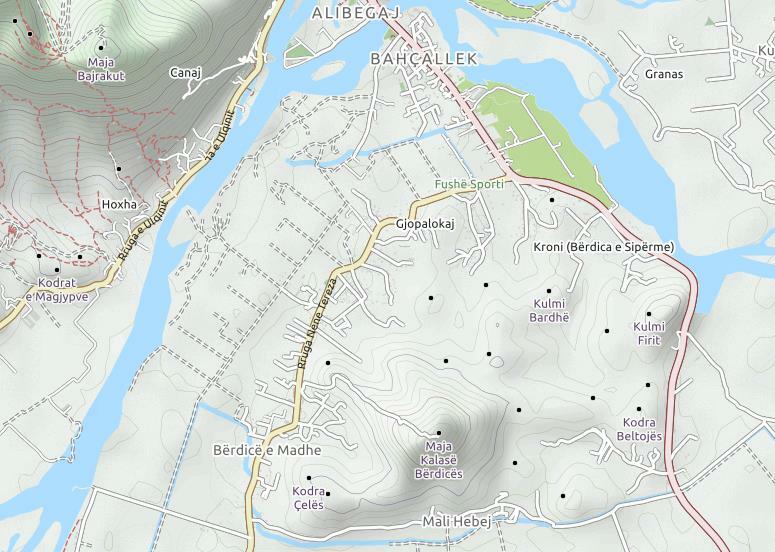 Although this report may turn out a trifle long, it would seem appropriate to enumerate the individual parishes and churches in Zadrima and to give some description of Zadrima because it is a very extensive area. Zadrima is twenty miles in circumference and has a total of one thousand homes, of which 700 are faithful and the rest are Muslim. These one thousand homes can be divided up into thirty hamlets or villages, some large, some small. The Christian homes are mixed in with the Muslim ones. There are also a number of schismatic homes, but very few, and they are being converted by the grace of God, though more so the women than the men. Up to now, the bishop has converted and reconciliated with the Church four such women, and he hopes with time to convert them all to the Holy Roman Church. 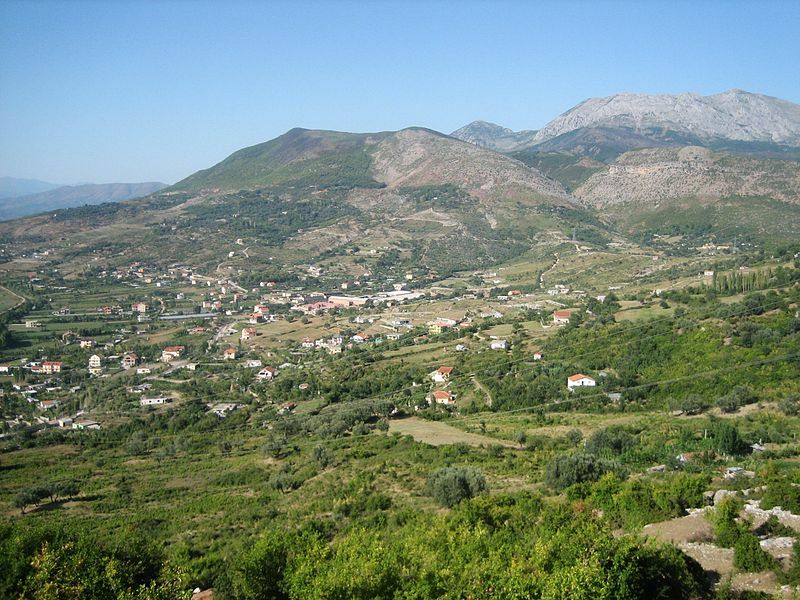 Zadrima is situated in Albania as a little province of its own between Shkodra and Lezha, both towns being located on a beautiful plain, most of which lies alongside the Drin. They are very fertile fields, abundant in all sorts of fruit and in particular in wheat, millet and wine. There are figs, pears, plums, pomegranates, muskmelons, watermelons, lettuce, chicory, turnips, garlic, onions and other greens, with all sorts of vegetables thanks be to God. There are oxen, cows, sheep, pigs, horses and other animals in great quantities. There are fresh springs every mile along the foot of the lofty mountains which surround it, with pleasant views to the south, east and north. It is blessed with as many beautiful hills and mounds as one could possibly want. Churches have been built on most of them with their altars facing towards the east and their main doors opening to the west. There are large and fair rivers like the Drin, the Gomesigeia (Gomsiqja) and the Ghiadri (Gjadër), full of all sorts of fat fish, big and small. There are other small waterways, too, full of watermills to mill every type of grain. The air is extremely healthy and there is, in general, quite enough of everything one needs for human existence. 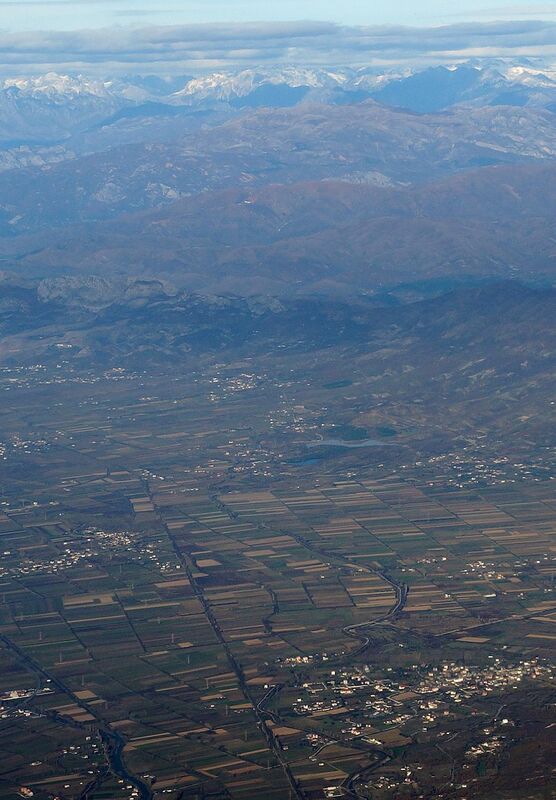 In autumn and in winter, this region is affected by the northern wind and in summer it is affected by a fresh southern breeze which the Albanians calls frosgia (freskia). But who can enjoy all of this? It is the cruel greed of the Turks who exploit the poor and miserable Christians with their continual demands for tribute, tithes and lodging. Ten to fifteen high ranking Turks travel together to the homes of the Christians, knowing the latter have something to offer. They eat and drink all they can all day long without paying anything. And the poor Christian is not allowed to say he has no more bread, wine, meat or fodder for their horses because they would otherwise tear the house apart, beat him savagely on the feet, and mount his wife. If he does not have the food they demand, he must go to other nearby Christian homes in search of it. And if he has nothing else to offer to these odious people, he must give them the clothes off his back. Does anyone take pity on him? Whoever's house is invaded by them must quickly hide the women, who become excited by their lewd glances. Every time the Turks need workers for cutting and harvesting, for ploughing the soil, for sowing seed, for building houses and manors, for carrying wood and water, and for other services, they force the Christians to do this work at any time, even when it is snowing, without paying them anything. They hardly give them anything to eat, just millet bread and a bit of cheese. The poor Christians lose time during the harvest for their own work. They work on holidays, too, and are given no time to rest except on Easter and Christmas. The Turks take Christian women and girls by force for their wives, in particular to get their inheritances, because they themselves are orphans, and in order to be better attended upon at home. They let them remain Christians, though. Indeed with great threats, they force the parish priests and the bishop to hear their confessions, something which is forbidden by order of the pope. The bishop suffers much damage, tribulation and calumny because he forbids such things and he will not be able to hold out much longer if some sort of solution is not found. They also force them to baptize their children, not so that they become Christians, but so that they do not stink and will not be devoured by wild animals. They say they will turn Turk if they are not given communion, so a solution must be found as soon as possible. At the time of the Sultan Suleyman, emperor of the Turks, a Muslim lord called the Pasha of Dukagjini (who is the leader of many provinces) passed through Zadrima and was so taken by it that he returned to Constantinople and asked the said emperor to do him the honour of giving him Zadrima as a fief (which in Turkish is called a vakuf) for the sake of his soul, on the condition that he build thirty bridges across the rivers of Zadrima so that, when he died, they would serve travellers to the benefit of his soul. The emperor was also to give orders that the people not be subjected to the spahees as are all the other Christians of Macedonia and the other regions under the Turks, but rather directly to the emperor by a revenue collector, who would be appointed annually. Most of the people of Zadrima agreed to this so that they would pay much less than what the other said regions pay. In order to preserve and maintain this custom, Zadrima must often send a delegation of elders to Constantinople to renew the order of the Turkish emperors, so that the people not be subjected to the influence of the spahees in timars, and not be tyrannized by the sanjak beys, revenue collectors, kadis, voyvodes or other evil Turks. The people of Zadrima possess five hundred documents signed personally by the hand of the Turkish emperor to protect them against these officials, i.e. firstly by the said Sultan Suleyman, then by his successors, Selim, Bayazid, Amurath III, Osman who was murdered in Poland, Mustapha, Amurath IV and the present Sultan Ibrahim. The province of Zadrima is governed like a republic because, several times a year, they all gather together from house to house, in particular the elders, who are their leaders, in order to keep up the said bridges. Otherwise, they would lose their status as a vakuf and the elders would be decapitated if any of the bridges were to be found is such a state of disrepair that the sanjak bey could not cross them or if the revenue collector or other evil Turks should be impeded by them. The latter would then contest the order and endeavour to tyrannize the country by eating everywhere and tearing things to pieces, as was said above. As to the revenue collectors and kadis, they will be referred to below. The head of the assembly of the people of Zadrima is the bishop, but he must originate and be born in Zadrima. The bishop, however, endeavours to avoid the honour because the assembly always takes the side of the Turks. Should anyone speak against the Turks, he is subjected to abuse and persecution, leading to his expulsion from the country, or he must pay many aspers and come up with many presents in order to pacify them. Should anyone speak critically of the interests of the country, he must fear for his soul and will suffer the malevolence of the people with a thousand curses. It is impossible not to attend, for the assemblies in this region speak very badly of anyone who is not present. As such, one must act as best one can, and it has been shown that the bishop can best withstand encounters with the infidels if he is united with the country. The river Drin causes just as much damage to the people of the flat land of Zadrima as the Turks, because, stemming from the border with Serbia, it flows down, making its way through the high mountains of Dukagjini and Pult in the Albanian highlands. From time to time it overflows, in the winter from the great amount of precipitation and in spring from the melting of ice and snow in the mountains. It flows precipitously with great force into the valley and fields of Zadrima, covering them completely. Then it continues down through the valley, touching the walls of the ancient city of Lezha and enters the Adriatic Sea, two miles away from the town, taking with it the fertile land and soil of the said fields. At the present moment, it has left its ancient bed in the valley of As... on the western side of the diocese of Shkodra, and has entered the territory of Zadrima where it has destroyed over 150 houses of the faithful and of the infidels at Upper and Lower Mietti (Mjeda), and at the ford of Dagno (Deja), a ruined town, which will be referred to below. It has laid waste to over twenty thousand ploughing days of valuable land, which produces annually every type of fruit one could imagine and every plant and seed. Now the land is covered in sand and mud, to the great detriment of its owners and cultivators. With the help of God we shall now turn to the enumeration and description of the parish churches of Zadrima. There are nine parish churches. The first of these is the said parish church of Saint George in Nënshat, which was referred to earlier when the town of Sapa was mentioned. The second is the church of Saint Mary of the Assumption in Trosani (Troshan), a village of seventy houses together with Ficsta (Fishta), another village. They included 700 Christian souls. There are two parish priests who tend to their souls. One of them is called Dom Primus Sinzi (Prend Sinci), an old man with forty years of service, and the other Dom Peter Manesi (Pjetër Manesi), the assistant of the old man. The said seventy houses, with a small number of vineyards and the church land, provide the parish priests with an annual income of seventy reals. This church disposes of a silver cross, chalices also of silver, and other simple objects needed for a modest mass at the two altars. The people of Zadrima say that this church was built by Palaeologus, emperor of the Greeks. It is small and it can be seen that it is very old, built in the middle of the said village of Troshan, at a secluded site in the bosom of the high mountains called Cresta (Kreshta). The said parish priests live one mile away in a village cell built by the priests, also at a distance from the houses of the secular priests. The reformed fathers of Saint Francis, who have been missionaries in this region for six years now, have built an oratory and a little house one mile from the Church of the Assumption. It is there that the prefect of the mission lives together with two other friars. In the year 1639, the deputy prefect had a sumptuously high and fair oratory built. But as is the case with such constructions, when the leaders of the Turks saw the oratory built differently than is normally done in this region, they became suspicious and gathered together all the leading Turks in the bishopric of Zadrima from the towns of Shkodra, Antivari (Bar), Dulcignoi (Ulcinj) and Croia (Kruja), causing all the poor faithful to shake for fear of great persecution, and without delay ordered that the said oratory be razed to its foundations. They also caused the said deputy prefect Cherubin and two of the friars accompanying him to be arrested. In addition, they threatened all the Christian leaders of Albania with a terrible death. The Turks were subsequently placated somewhat with money and other gifts. The said fathers, after five months of torment, and nights with chains around their necks, were later saved from the sacrilegious and brutal hands of the Turks and were recompensed by the poor faithful of Zadrima with fifteen thousand aspers. Among the harm and many evil things which were done to the bishop of Zadrima, who had taken the side of the poor priests in chains, was to threaten to chop off his head if any priest, friar or bishop should go to Rome, because all of them were considered spies and traitors to the Grand Turk. Nor was any village to build any oratories or chapels or to restore any more churches, all this being put under severe sanctions. The first order, i.e. about going to Rome, was revoked on the demand of Mehmet Bey of Shkodra and with the permission of the governor of the town. One can imagine how much money and how many gifts for the Turks were necessary to get the permission. The second order, i.e. about building and restoring churches in disrepair, remains unrevoked to the great distress and suffering of the souls of the faithful, and at the present moment it is impossible to reach an agreement to revoke it until the elders of Zadrima and the bishop himself go to Constantinople. For this, they would need assistance and the recommendation of the Catholic ambassadors. The third parish church is that of Saint Stephen the Protomartyr between Blinisht and Gjadër, both of which are large villages built by the aforementioned Lord Nicholas Dukagjini the way the people of Zadrima like them to be built. It is situated on the banks of the Drin on a fair and fertile field producing wheat and millet in particular, and is half a mile away from the said villages, which hasten hither in great numbers to mass, preaching and the sacraments. This is the largest and richest parish not only in Zadrima, but in all of Albania, because the village, or rather the fortress of Blinisht contains 150 Christian homes. Even the poorest household here has three family members, whereas the richest have up to forty family members including second and third cousins with their children, grandchildren and great grandchildren. There are over 1,800 Christian souls here. There are no Muslim homes in Blinisht, nor do the Christians permit Muslims to build their homes among them. The village of Gjadër is part of the parish of Blinisht. It contains seventy Christian homes which consist of 500 souls. This village is very rich and is situated on the banks of the Drin, as is Blinisht which stretches for over one mile along the same river. The church of Saint Stephen is very small and can hold no more than 100 persons. It is surrounded by a courtyard with a brick roof. It has beautiful vestments for celebrating mass on the three altars bought by the people of Blinisht. It has a large and fair cross of gold plated silver, and only one chalice of silver. The other two, smaller ones, are made of tin. It is well off with bequests from the dying, with fields and vineyards which the Albanians call perivol. The said possessions and land provide the parish priests of this church with eighty quarts of wheat, millet and sorghum annually. A strong horse cannot carry more than three such quarts. The perivols on occasion provide 150 quarts of wine, sometimes more and sometimes less according to the season. Similarly, a strong horse could not carry more than three quarts. Three parish priests care for the souls of Blinisht and Gjadër. One of them is called Dom Peter Bianchi (Pjetër Bardhi), an important figure who was twice in Constantinople last year on behalf of the bishop and people of Zadrima with regard to the urgent needs of the Church and people of Zadrima, and the others, Dom John Milla (Gjon Milla) and Dom Simon Messi. They maintain three altar boys to care for the church and their monastic cell. The parish priests take sufficient care of the souls under their jurisdiction and live right in Blinisht in the cell built for them with an adjacent chapel, in which mass is celebrated almost every day. There are two large bell towers there which ring out every evening for Ave Maria and for feasts. The monastic cell is very comfortable and has a beautiful garden around it. The three priests receive 200 quarts of grain, i.e. wheat, millet and sorghum, from the tithes, in addition to the said produce from their possessions. If one were to sell it all, it would not make more than 200 reals. Since these priests are exposed to the road used by travelling Turks, they are exploited greatly and do not even enjoy half of the income they get. In fact, all of Blinisht is exposed to the voracity of the Turks so that they hardly manage to hold onto one third of their harvest. Sometimes in winter and in spring, as mentioned above, the Drin, swollen with rainwater, overflows and floods the homes of the people of Blinisht, flowing right into them and extinguishing the fires in their hearths. To save themselves, the people are obliged to climb onto their beds and up into the beams of their houses. They must take care to get their families, farm animals and other essential possessions up into the hills. For this period of time at least, they are saved from the voracity of the Turks because they are protected by the Drin which, with the great amount of water it contains, floods the road for about ten days. The fourth parish church is that of Saint Demetrius in the village of Crutta (Krytha), whose feast day is celebrated by a great multitude of the faithful and by infidels on 26 October. It was restored thirty years ago by the inhabitants with the help of Dom George Bianchi (Gjergj Bardhi), the vicar of Zadrima of blessed memory. This church is situated in the middle of Zadrima as a large and tall building about a mile from the cathedral of Sapa. At a stone's throw to the south are the walls of the church of Saint Catherine which was abandoned by the inhabitants to fall to ruins because a Muslim committed an adulterous act in it. When it collapsed, the said Muslim met his downfall with all of his relatives for generations. As soon as it was in ruins, the people were amazed when they saw him in poverty. There are four villages which hasten to the church of Saint Demetrius to receive the holy sacraments. These are the village of Krytha with twenty houses, the village of Daicci (Dajç) with twenty houses, the village of Coterri (Kotërr) with twenty five houses and the village of Codeli (Kodhel) with twenty eight houses. The latter two villages are situated one mile away from the parish church and the others are situated in the vicinity. The four villages consist of a total of 800 faithful souls. This parish has good possessions and sometimes provides the priests with forty quarts of wheat and millet. They also collect eighty quarts of wheat and millet in tithes from the said houses. [This church] has two silver chalices and other objects needed for celebrating mass in a dignified manner at the two altars. It has no silver cross, only one made of wood. The faithful would like to buy one if they can find one in the region. There are three parish priests responsible for the 800 aforementioned souls. One is called Dom Mark Cruesiu (Mark Kryeziu) who has served there for 36 years and who is also the vicar of the Bishop of Zadrima. The other two are Dom John Jubani and Dom Paul Grinema, who always provide food for the two servants of the monastic cell and mass. Their cell is a stone's throw from the parish church. The said vicar has planted a vineyard on the land of Saint Demetrius and provides the parish with about nine quarts of wine according to the year. He also built the monastic cell with the help of the four aforementioned villages. This parish priest was the one who has always provided a great increase in wealth to the parish. In the region and in the villages of this parish there are many Muslim homes, and many officials of the sultan live here, among whom is the revenue collector. He exacts tribute in the form of a tithe on grain, wine and other fruits which grow in Zadrima. On seven quarts of grain, he takes one, and on seven or six quarts of wine he takes one for the sultan. He taxes other fruits, too. On fourteen quarts he takes two, and from someone producing twenty-eight he takes four, and on fifty-six he takes eight and so on for all possible fruits. But as an imperial privilege, it is not for all the fruits of Zadrima. It is only on wine and the sorts of grain which make bread, because it is a vakuf, as they say. Here lives also the kadi or judge over the Muslims and Christians, who is replaced by the sultan every eighteen months and who makes justice among the Christians and Muslims. Whoever gives him the most money or the most presents, gets the more favourable judgment. The revenue collector is replaced almost every year because some of them are poor and others are insatiable in their lust for money. They tyrannize the poor Christians and drive them to ruin. These offices are bought from the sultan in order to collect taxes and to decimate Zadrima. For example, six thousand scudi for the sultan, and they are not satisfied when they have got six thousand. They want one thousand more, sometimes even three or four thousand more. They constantly go about slandering and accusing the poor faithful of murder, theft, usury and other crimes. With their voracity, beatings, chains and other instruments of torment, they force the people to buy their salvation with aspers. For example, with six thousand scudi given to the sultan, you can be released. The poor Christians are thus oppressed, some being forced to pay twelve to fifteen thousand scudi. Mercy! The parish priests and many other devout people say that every year around the time of the birth of Our Lord Jesus Christ, the bells ring out in the aforementioned church of Saint Demetrius, even though the doors are shut and locked. It is said that they believe there to be a hidden miracle there. The fifth parish is that of Saint Pantaleon of Baba (Maba) on a hill in the valley of Maba. It is a solid construction. On its walls one can see written that it was consecrated by Antonio Bruni, the Archbishop of Bar. There are five villages which hasten hither to receive the holy sacraments at this church, i.e. the village of Maba with thirty houses, the village of Soisi (Zojz) with twenty houses, the village of Gramsi (Gramsh) with twenty houses, the village of Dragusa (Dragusha) with eight houses, and the village of Pocerami (Paçram) with seven houses. Most distant are Zojz and Paçram, a mile and a half away. These villages include over one thousand Christian souls. This church has fifty ploughing days of land which provide the parish priests every year with more or less forty quarts of grain, millet and other produce. A hand servant of Mehmet Bey, the Sanjak Bey of Shkodra, built some houses near to a piece of land belonging to Saint Pantaleon and forced the Christians and the bishop to give him the land. Seeing that the church had no use for this piece of land, which the hand servant purposely devastated with his animals, they were forced, with the approval of the said villages, to hand it over to him. This parish has two priests, one of whom is called Dom Nicholas Leccha (Nikollë Leka), an Albanian from Saint Paul's in the mountains of Dukagjini. He is an unreliable person and, as has been reported many times in writing, is extremely dissolute. He irresponsibly took over the parish with the help of the Muslims and is keeping it against the will of the bishop and the holy canons. He very rarely says mass and very rarely celebrates the holy offices. The faithful secular and other priests complained to the Turks and to their tribunal. He does not reside at the monastic cell, nor does he take any care of the parish which he enjoys without right. In short, all of his activities are on behalf of the Turks and not for the Christians. The bishop is not even able to chastise him because he would immediately run off to his Turkish lords and would make accusations resulting in capital punishment. More than once have longer reports been made about his activities with witnessed evidence as to his scandalous deeds. If no one takes action against him, he himself will perish from his wicked deeds, causing the ruin of his family. The other priest is called Dom Primus Melici (Prend Melici), a capable young man. He was appointed assistant there two years ago by Friar Nicholas. These parish priests receive about 180 quarts of millet and wheat, including forty quarts from the aforementioned land. A quart of wheat costs eight julius in Shkodra this year, such that a horse of wheat is equivalent to 24 julius and a horse of millet is equivalent to 120 aspers or 12 julius. This church has its own monastic cell at an arrow's distance, but the priests do not live in it for fear of the Turks, who often come to eat there, and because of the bad care the abbot Nicholas takes of it. It is to be hoped that measures will be taken against him for the sake of the many souls who are scandalized by his deeds. It has one silver cross, two chalices and four chasubles, as well as many robes and other things necessary for saying mass at the two altars. The sixth is the parish of Saint John the Decapitated, situated in the village of Schiesi (Shkjeza) and built on a hill overlooking the Drin. On a stone set in the wall there, written in ancient Latin characters, one can see that it was built by Urosh, the holy king of Serbia, also called Milutin. It later fell into ruins and was restored by the people of Shkjeza. It has no land because that was all stolen and sold off by a Turk who was sent by the sultan to the bishop of Zadrima at the time of Tosolo Bianchi (Tozol Bardhi) to sell off all the possessions of the churches of Zadrima and of all Albania to make money. All the other people of Zadrima paid for the church property at half the price the Turks were demanding. But the people of Shkjeza were not willing to give anything because they said they did not want to pay for the wife and children of the priest. The priest was married at the time, although he was of Latin rite. As such, the officials of the sultan sold everything off to the other Turks and now it has only two ploughing days of land, left by the people at the insistence of the bishop. This church has two parish priests, one of whom is called Dom Jack Cabasci (Gjek Kabashi) the Elder, who has been serving there for thirty years. And all these thirty years he has spent sleeping and eating from one home to another in the said village of Shkjeza. This is because the parish has no monastic cell of its own for the priests, since they would be very much exposed to the voracity of the Turks. The other priest is called Dom Martin Gama (Merti Gama). In all of Zadrima there is no poorer parish than this one because, as mentioned above, it has no property and there are only twenty houses under its jurisdiction (comprising 250 faithful souls). These homes provide the said priests with forty quarts of wheat. The said Dom Martin is well off in his family home, from which he receives assistance. He is now housed there as an assistant on the demand of the council of elders of the said Dom Jack. Near the church of Saint John, separated only by the Drin, are the manors and homes where Mehmet Beg of Shkodra lives, an extremely influential person of an ancient and very powerful lineage in Albania. He is very wealthy. Up to 200 people, Muslims only, live constantly at his home and are all in his service. He is a benefactor, and malefactor of the Christians. Within twenty days at the latest, the bishop is forced to go with the elders of Zadrima and present gifts, including cakes, roosters, geese, lambs, fruit and other delicious foods. Otherwise he would not be able to survive or serve his diocese as bishop because of the tyranny of the other insolent Turks. The seventh parish is the church of Saint Mary of the Nativity below Deja, built in the valley of Mount Deja, an arrow's shot from the Drin. Deja is a town which was destroyed at the time of prince Scanderbeg. This church of the nativity is small but beautifully built, all in blocks of carved stonework and with floors and ceilings made of wooden boards, and roofed with tiles. It is thought that it was built thus by Helen of France, the wife of King Stephen of Serbia. No other church in Zadrima is as beautiful as this one. It has mediocre vestments for celebrating mass at the two altars. It has one cross and one silver chalice. It has little land because the Drin has eroded it. There are six villages which hasten to receive the holy sacraments at this church: the village of upper Mieti (Mjeda), the village of Spadari (Spathar), Sadegna (Zadeja), Sceldia (Sheldia), Lissena (Lisna) and Laci (Laç). The village farthest from the church is two miles away. In all, there are 100 homes and 700 faithful souls, who are cared for by Dom Luke (Luka). He does not have a monastic cell and has been forced by the bishop to build one, because he is always busy repairing the house of his brother, where he lives, a mile and a half away from the parish. In the said village of upper Mjeda there are many Muslim lords and a mosque, i.e. the place where the Muslims gather every Friday to hear the word of Mohammed from their hodja, or preacher. In this place, many Christians have turned Turk, particularly during Bajram, which is the Easter of their evil fasting period. However, at the present time, thank God, the Christians are maintaining their faith and do not deny it, thanks to the continual exhortations and preaching of the true faith and law. The eighth parish is Saint Mary of the Assumption of Galina (Glina), built in a valley between the rivers Gjadër and Glina. There are three villages which hasten hither to receive the holy sacraments: the village of Haemeli (Hajmel) with thirty houses, the village of Ranesa (Raneza) with twenty houses and the village of Naraci (Naraç) with sixteen houses. All together they make up 490 faithful souls. In these three villages there are about twenty Muslim houses and three schismatic ones. This parish possesses little land. It has, however, a fair and large vineyard which sometimes provides the parish priests with thirty quarts of wine. It has a monastic cell near the vineyard, built by a Christian called Martin Busa (Merti Buza), who is now dead. He restored many other churches in Zadrima at his own expense, too, as he was well off and had no children. The cell is one mile from the said church of the Madonna of Glina. In it live two parish priests from the three aforementioned villages. One of them is called Dom Peter Busa (Pjetër Buza) who has served here for twenty years. He is now unable to walk and his eyes can often not see well enough to say mass and the service. He was therefore obliged by the bishop to take on an assistant, Dom George Jubani (Gjergj Jubani). The latter is a priest of good conduct who satisfies all the needs of his people to the great satisfaction of the bishop. He is bothered by a certain Dom Peter Soimiri (Pjetër Sojmiri) who wants to get the job as parish priest with the help of the Turks, after having been deprived of the position due to his own misdeeds. Aside from the aforementioned wine, the parish provides the said priests with tithes and other alms consisting of wheat, millet and wine, to a value of eighty reals. This church is well served by the said Jubani. It has a silver cross, two chalices and other things needed for celebrating mass at the two altars. It is an old church and we have not been able to find out who built it. The ninth parish is that of Saint Mary of the Assumption. Many churches in Albania are dedicated to the Mother of God. We spoke of this church earlier when we dealt with the town of Zadrima. The vestments of said churches were bought by the people there, but the chasubles and chalices were donated by Rome as alms from pious individuals for the priests, friars and bishops. The latter distributed the goods among the parishes needing them, having being requested to do so by the benefactors. Aside from the nine aforementioned parish churches, there are eight other little churches or commemorative chapels in Zadrima, which are called bishop's chapels. Mass is celebrated in them a very few times a year because they have no priests of their own, nor vestments. Corpses are occasionally buried in them. The first among these chapels is Saint Veneranda who is commemorated in the village of Zojz on the day of Saint Anne in mid-July. Many people attend the feast, both Christians and infidels. The second one is Saint Mark the Evangelist on Mount Deja who is celebrated with great attendance on his feast day in April. It is a large chapel, restored by the aforementioned Merti Buza and his people. It has no land or vestments. Sometimes during the year, the parish priest of Saint Mary of Deja celebrates mass here, taking his own robes with him. The third is Saint Angelus which is celebrated during Pentecost in the village of Nënshat on the top of a high mountain with many people attending. It has no vestments. The fourth chapel is Saint Nicholas of Lumesi (Lumës) in the village of Lower Mjeda, which the predecessor transformed from a bishop's chapel into a parish church. It is well situated in a valley, but the Drin has carried off the surrounding land. There are thirty houses comprising 300 souls who hasten hither to receive the holy sacraments. The priest of this parish is Dom Mark Lumësi, an ignorant individual devoid of conscience or obedience to the bishop from whom, with the assistance of the powerful Turks and the secular priests, he stole the parish. He forgot his duties and agreed to give dispensation to a murderer on condition that the latter go to Pult and serve there as a parish priest for the many people in that parish deprived of a priest. This parish has its own monastic cell on land which is not good. It has some vineyards and gardens, but everything is in bad shape due to the lack of attention paid by the said friar Lumësi. The bishop is unable to punish him because, as he is a follower of the said Abbot Nicholas, he runs to the Turks to spread slander. The poor bishop is therefore mistreated because of the false accusations. Let us pray to the heart of Jesus Christ that measures may be taken against the two priests who are corrupting and destroying this diocese. This little parish has mediocre vestments to celebrate mass at the one altar. The priest disposes of thirty quarts of grain and millet with which he can hardly get by. The fifth is Saint John of Hajmel restored ten years ago by the said Merti. Here mass is celebrated many times a year because it is convenient for the village of Hajmel during rain and bad weather. No one is buried and no children are baptised here. There are no vestments or land, and there are about eighty people living here. The sixth is Saint George in ruins on a hill. Mass is rarely said here, and only by the parish priest of Lumës. There are no vestments. The seventh is Saint Veneranda above Succha (Suka), desecrated by the Turks. It is open and there is nothing good which can be said about it. Mass is never said here. The eighth is Saint John the Decapitated at Calameti (Kallmet). The parish priests of Troshan say mass here six or seven times a year. The four houses of Bardagni (Bardhaj) bury their dead here. It has some land. It has no vestments for celebrating mass. The bishop is wont to visit this chapel several times a year and say mass here. The ninth is Saint James in Suka on the territory of the aforementioned village of Blinisht near the hillock of the torrent of Lusia. It is in ruins and it must be restored because the people of Blinisht have nowhere to bury their dead, in particular when the Drin floods. The aforementioned parish churches and chapels were all built with sacrificial altars towards the east and with the main entrances towards the west. Most of them do not hold more than 400 people. They are all covered in tiles, and are low constructions without flooring, without bell towers, but with graveyards at the side. They have no candelabras and are made only of wood. They have no tabernacles. As phials they use little gourds at the altar. All are painted with Greek pictures, mostly with the Virgin and the Child at her breast, the Apostles and the Greek fathers, Basil, Athanasius, Chrysostom and others. In none of them can one see the date, nor can one tell for certain who made them because of their age. At the present time it is known that, because many of the churches were destroyed by the Turks and others collapsed with age, they were reconstructed and refurnished by the Christians of Zadrima with the authorization of the sultan. The graves are divided among the churches by the faithful. Every house has a holy place in the church, some larger, some smaller, in accordance with the work they contributed towards the needs of the church. They place heavy flagstones on the graves, seven palms long, such that it is difficult to walk over them without tripping. 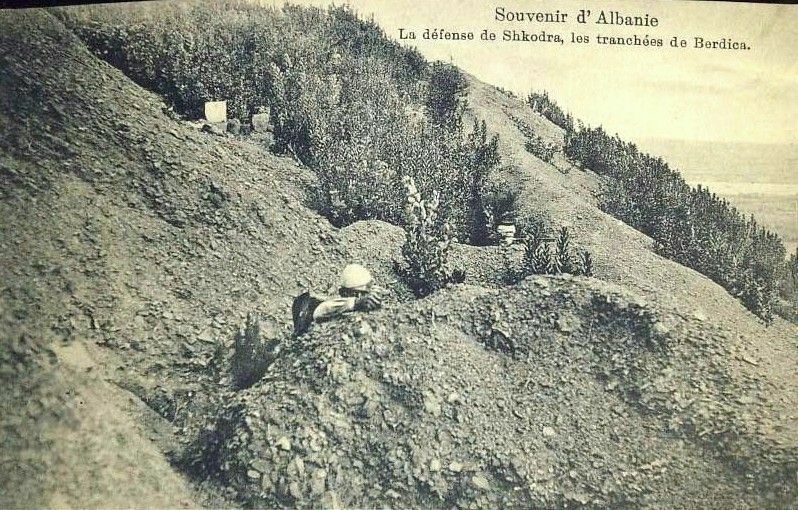 These Albanians mourn their relatives from the depths of their hearts at the moment of their deaths, and in particular when they bear them to their graves, all in the same manner. They tear their clothes and the men scratch their faces with their fingernails until the blood flows in streams. They do not shave for a whole year as a sign of their great sorrow. The women cut their hair and beat their breasts such that, at times, it is difficult to carry out the ceremony because of all the tearful lamentation. When they bring their dead to church and are approaching, they cry as loudly as they can 'kyrie eleison, kyrie eleison' and then, when the dead have been buried, they all go home to eat at the house of the dead person, and if he had nothing, they gather among themselves. Sometimes, according to whether the family was rich or poor, up to one hundred people, men and women, gather to dine at the house of the dead person. If they do not attend, the relatives of the dead person are greatly offended. Exhorted by the bishop and the priests, those who are dying leave something every year to the churches. Some leave their vineyards, some their fields and others pay for a mass. The women leave behind tablecloths and blouses, though in coarse cloth and roughly embroidered. Those who are alive ask the priests every year to say mass for their dead relatives, and almost every household offers them a meal. Indulgences are given in each of the said parishes every seven to ten years. In the cathedral of Saint Michael, there are perpetual indulgences given in memory of the blessed Gregory XIII. Whenever a priest chosen by the Bishop of Sapa says mass in that cathedral for some soul in purgatory, that soul receives an indulgence (remission and liberation) just as if the said priest had celebrated the mass at the altar of Saint Gregory in Rome. It is necessary for the bishop to visit the said parishes almost every eight days to care for the secular priests and to overcome the defects which the priests there, because of their great ignorance, are wont to commit when caring for souls. The faithful of Zadrima now attend their churches and prayer houses a lot. They are all of Latin rite but are mixed with many Muslims, by whom they are sorely oppressed, as they say. The poor faithful of Zadrima lead a laborious and austere life because they sleep in the countryside all summer long in order to live off the land. They are exposed to the sun without the protection of headgear. Some are with their hoes in the vineyards, others are with their oxen in the fields, and the women are with scythes to cut the grain, millet, barley and sorghum. Most of them have no wine to drink, only millet bread and water, and sometimes a few vegetables without oil. Nonetheless they fast during the lenten period, on vigils and on their days of devotion. So the years pass. The women in particular drink very little wine on rare occasions during the year. Most of them are without hats and walk barefoot in the mud, over stones and in the ice and snow, and in the summer they are exposed to the heat of the sun. In short, they put up with much suffering. The Albanian race is unspeakably fatigued. There are no prostitutes in Albania and if any are found out, their parents kill them immediately. There are many illnesses in Albania, among which are: tertian fever in the summer from the foul state of the many ditches, as well as chills from working hard in the cold. There is no gout in Albania. 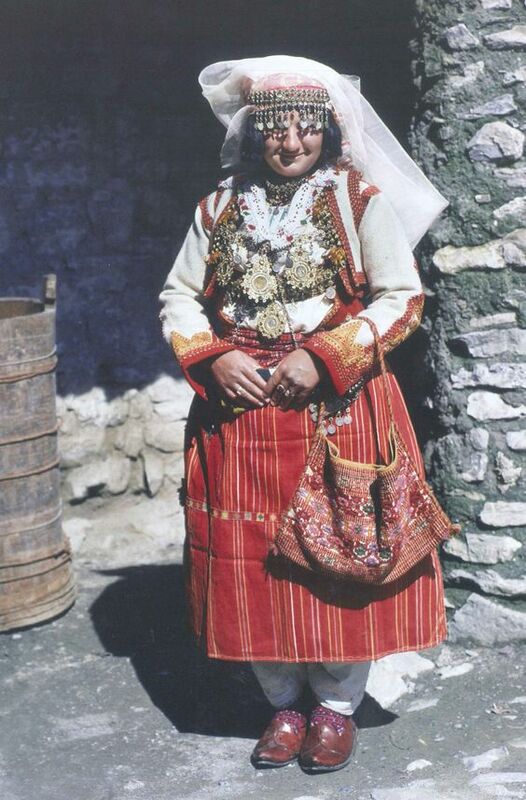 The Albanians sit at table for a long time, from noon to evening, or from evening to midnight. They do not eat all the while, but spend their time drinking and discussing. The arguments and conclusions they draw provide answers to every problem of philosophy. Most of them are very poor, as they are oppressed by the Turks, but there are also some very rich people, not so much with money, but with the extensive and fair property they own. Both rich and poor live in the countryside and in towns. Every year they celebrate the patron saint of their parish church with great expense, inviting their friends and, in particular, their in laws for two or three days. The women are more pious and go to church more often. They also spend much money on weddings, and subsequently have nothing to live from. Even if there are ten brothers in a family, they all get married and when their offspring are later grown up, the disputes among them begin, and they separate and all go their own way. The Albanians make accusations against one another with the Turks because of blood feuding, which is the ruin of this country. The present Bishop of Zadrima has written much more about the good and bad habits of the Albanians and about their virtues and vices in other reports sent to the Holy Congregation in 1638 and thereafter. (1) Nënshat is actually 'Lower Shat', related to Alb. nën 'under, lower' and village of Sat, later Shat. Drin odn. Drini (srp. Дрим (Drim); makedonski Дрим) nastaje spajanjem Bijelog i Crnog Drima. Drin ima dva ušća, što je posljedica odvajanja jednog rukavca u mjestu Vau-Dejës. Jedan rukavac ide prema jugu, prolazi pokraj grada Lješa i ulijeva se u Jadransko more. Drugi ide prema zapadu, te se južno od Skadra ulijeva u Bojanu, neposredno nakon njenog izlaska iz Skadarskog jezera. Reka Drim nastaje spajanjem Belog i Crnog Drima kod grada Kukes u severoistočnoj Albaniji. Od tog mesta do ušća u Jadransko more Drim je dugačak 160 km. Sa Belim Drimom, ukupna dužina reke je 335 km. Blizu Skadra, Drim se deli na dva rukavca (bifurkacija). Jedan od njih se uliva u Jadran južno od grada Lješ, a drugi, manji, uliva se u reku Bojana. Drugi rukavac je nastao 1858. 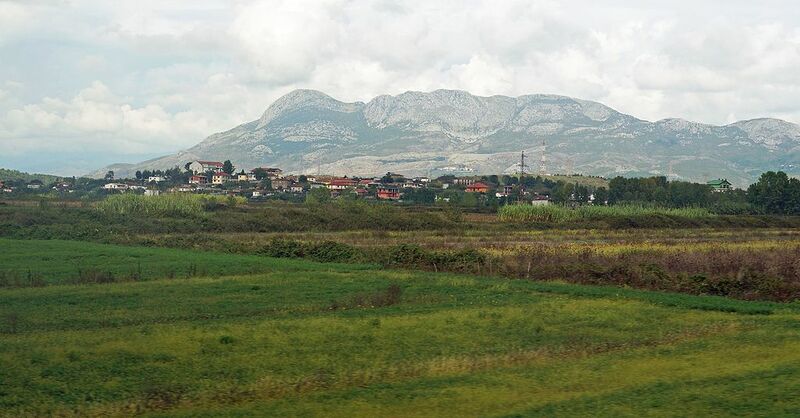 ​At Vau i Dejës, it enters the low Shkodër Field and splits into two arms. 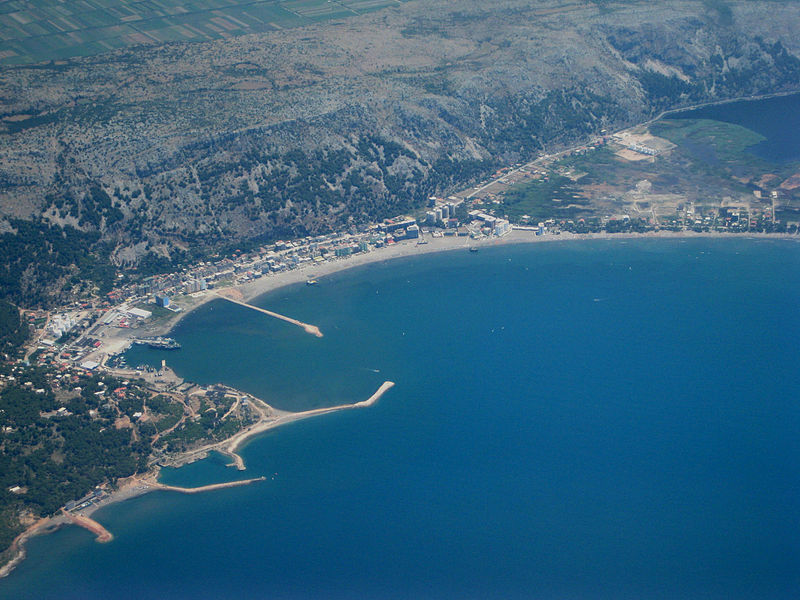 One empties into the Bay of Drin into the Adriatic Sea southwest of Lezhë, forming the Mouth of Drin, Albanian: Gryk' e Drinit). The other empties into the Bojana River near the Rozafa Castle. 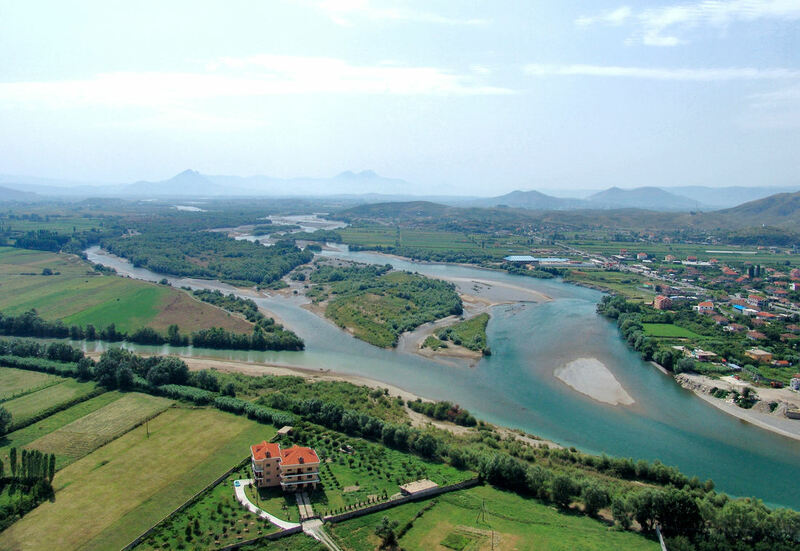 Measured from the source of White Drin, the rivers length is 335 km (208 mi), making it the longest river in Albania. The Black Drin flows out from the Lake Ohrid near Struga and flow through eastern Albania and western Macedonia. The White Drin originates from the Zhleb mountain, north of the town of Pejë in the Dukagjin region of Kosovo,[a] and flows from there through to Albania. The basin encompasses the transboundary subbasins of Lake Shkodër (largest lake in Southern Europe), Lake Ohrid (one of the most ancient lakes in the World), Lake Prespa and Small Prespa Lake and also the tributaries, namely Black Drin, White Drin and Buna River. All these subbasins and tributaries are home to numerous species of mammals, vascular plants, insects, amphibians, fishand birds. Poplave na ovom prostoru predstavljaju opasnost za ljude, kao i za biljni i životinjski svijet, a nanose i nesumljivu materijalnu štetu. Poplave većih razmjera dogodile su se 2010. i 2011. godine i izazvale su veliku materijalnu štetu na prostoru Crne Gore i na prostoru Albanije. Tokom 2010. godine jezero je dostiglo najveći ikada izmjereni nivo od 10.44 metara. Ukupna površina sliva Skadarskog jezera je 5490 km2 . Od toga je na prostoru Crne Gore 4460 km2 . Sama površina jezera na godišnjem nivou varira između 370 i 550 kvadratnih kilometara. Kada površina jezera zahvata 505 kvadratnih kilometara, Crnoj Gori pripada 67,3%, odnosno 340 km2 . U vrijeme kada je površina jezera 533 km2 , tada je na prostoru Crne Gore potopljeno 14.550 hektara zemljišta, a na prostoru Albanije 1500 hektara. Upravo je to prostor koji je potopljen 1858. godine skretanjem rijeke Drim u rijeku Bojanu. Poplave oko Skadarskog jezera i toka Bojane moguće je riješiti prije svega regulacijom Drima i regulacijom Bojane. U najvećem dijelu godine rijeka Morača sa svojim pritokama daje najveće količine vode Skadarskom jezeru, pa je vodostaj Jezera pod direktnim uticajem dotoka vode Morače. Međutim, u nepovoljnim hidrološkim uslovima uzrokovanih velikim padavinama, dio voda jezero dobija od rijeke Drim, u periodu kada su kote voda rijeke Drim na njegovom ušću u Bojanu više od nivoa voda Skadarskog jezera. Tada dio njegovih voda skreće na sjever i vododotokom Bojane uliva se u Skadarsko jezero. Dodatni problem predstavljaju i tri velike akumulacije izgrađene krajem šezdesetih godina dvadesetog vijeka na rijeci Drim, koje su u potpunosti izmijenile prirodni režimi voda i nanosa rijeke Drim. Postoje podaci još iz 1846 godine o poplavama do kojih je došlo usmjeravanjem rijeke Kiri prema Bojani, kao iz 1846 godine, kada je dio Drima (Drinjača) skrenut prema toku Bojane, kada su se na graničnom prostor Crne Gore, Albanije i Kosova dogodile velike hidrološke promjene. Iste godine nastale su velike poplave u Zetskoj ravnici, a nivo jezera se podigao preko tri metra. Od tada se na različite načine razmatra ideja o vraćanju Drima u staro korito. Više puta, a još od daleke 1878. godine razmatrane su ideje o mogućim aktivnostima i načinima smanjenja nivoa Skadarskog jezera na prostoru Crne Gore i Albanije. Ovi pokušaji nastavljeni su i posle II Svjetskog rata, ali kao i prethodni, nisu realizovani. Zaključak svih ovih projekata bio je da je u cilju zaštite od poplavljivanja neophodno vratiti dio toka rijeke Drim (Drinjača) u staro korito i obezbjiediti da nivo vode u Skadarskom jezeru varira između 4.5 i 6.5 m nadmorske visine. Na žalost, ne samo da ovi planovi nisu ostvareni, već je cilju izgradnje akumulacije kompletan tok Drima kasnije preveden u rijeku Bojanu. Berdica, Brdica odn. albanski Bërdicë je mjesna zajednica, selo i istoimeno brdo južno od Skadra. NASELJA Postoje tri naselja s imenom Berdica: Bërdicë e Madhe (Velika Berdica), Bërdicë e Mesme (Srednja Berdica) i Bërdicë e Sipërme (Gornja Berdica), te više zaselaka koji pripadaju Berdici. Na Gornju Berdicu, prema sjeveru nastavlja se Bahçallëk, najjužnije gradsko naselje Skadra. BRDO Puni naziv brda, visoko 166 m, je maja Kalasë Bërdicës. Kako se radi o osamljenom vrhu, s njega se pruža širok pogled od nizine uz rijeku Bojanu, masiva Rumije, Prokletije, ravnicu Zadrime i dr.
ADMINISTRATIVNA JEDINICA Mjesna zajednica Berdica je jedna od 11 mjesnih zajednica Skadarskog distrikta (Rreth Shkodrës). Nalazi se južno od grada Skadra i ima površinu od 31.02 km². Prema sjeveru graniči s gradom Skadrom, prema jugu mjesnom zajednicom Bushat, prema istoku granica je rijeka Drin (Veliki Drin), na zapadu je rjeka Bojana (alb. Buna) i zajednica Dajc. U prvom planu je ušće rijeke Veliki Drin u Bojanu, koja zatim nastavlja svoj kratki tok prema Jadranskom moru. Brdo u sredini fotografije je Berdica. Bitka na Brdici je vojni sukob koji se odigrao 8/9.2. (26/27.1. po starom kalendaru) 1913. godine, između Kraljevine Srbije i Osmanskog carstva. Bitka se odigrala u Prvom balkanskom ratu, zbog pomoći crnogorskoj vojsci oko opsade Skadra. Srpska vojska je poražena u ovom bitci, ali je njome potpomognut Zetski odred, koji je uspio zauzeti položaj Bardanjolt, jer su turske rezerve bile privučene Brdici. Posljedice vojnog neuspjeha bile su upućivanje na Skadar cijelog Primorskog kora Srpske vojske. S vojnog gledita, Brdica je bio utvrđeni položaj u vanjskom utvrđenom pojasu skadarske tvrđave, poznato po borbama tokom Prvog balkanskog rata između Srba i Turaka. Nalazi se oko 4 kilometra južno od Skadra između rijeka Drinjače i Bojane. U februaru 1913. Brdicu su napale srpske Primorske trupe. Ovo je zamišljeno da bi se pomogao napad Crnogoraca na Bardanjolt. Turska odbrana je imala 4 bataljona nizama i redifa, sa oko 20 artiljerijskih oruđa. Prilaz je bio vrlo težak zbog neprohodnog močvarnog zemljišta. Srbi su počeli sa napadima 8. februara. Čitav taj i idući dan su vođene teške borbe, ali položaj nije zauzet. Srpski gubici su bili oko 1000 mrtvih, ranjenih i nestalih, pa su dalji napadi prekinuti do dolaska pojačanja. Kad su pojačanja stigla, došlo je do odluke velikih sila da Skadar pripadne novoformiranoj Albaniji. Zbog ovoga se odustalo od daljih napada na Brdicu. Rovovi na brdu Berdica, dio linija obrane Skadra u Prvom balkanskom ratu 1913. PozadinaBrdica (albanski: Berdica) je brdo u Albaniji (169 m) u močvarnoj niziji 4 km južno od Skadra, koje služi kao utvrđeni položaj u vanjskom utvrđenom pojasu skadarske tvrđave. Nalazi se oko 4 kilometra južno od Skadra između rijeka Drinca i Bojane.Bojište se nalazilo na prostoru između Bojane, Drima, Melguškog i Brdičkog visa. Brdički vis je sačinjavao deo glavne obrane utvrđenog Skadra. Turska odbrana je imala 4 bataljona nizama i redifa, sa oko 20 artiljerijskih oruđa, odnosno 2-3 bataljona, sa 14 brdskih i 2 poljska topa. U borbi su učestvovale i sve turske rezerve sa Velikog Bardanjolta i 8 topova sa Malog Bardanjolta. Imali su dobro utvrđene položaje, celo bojište je bilo opasano sa 3 reda bodljikave žice, a pojedine, značajnije tačke i sa 5-6 redova. Prilaz je bio vrlo težak zbog neprohodnog močvarnog zemljišta. Posle zauzimanja Bušatskoga visa 25. januara, srbijanske primorske trupe su imale zadatak da produže napad na Brdicu radi olakšanja glavnog napada, koji je vršio crnogorski zetski odred na Bardanjolt. Tok bitke[uredi - уреди | uredi izvor]8. februara (26. januara po starom) 1913. je započeo opšti združeni srbijansko-crnogorski napad na Skadar. srbijanskePrimorske trupe su napale položaj Berdicu, a crnogorske Bardanjolt. Srbijanci su napali na Brdicu sa 1 eskadronom, 2 pešadijska puka drugog poziva, 2 bataljona prvog poziva, polovinom bataljona pionira, 8 brzometnih i 8 sporometnih topova s najvećim dometom od 5,5 km, a u boju nije učestvovalo (leva kolona) 3 bataljona prvog poziva i 3 bataljona crnogorske vojske, kao i 2 sporometna topa. 9. februara umorne jedinice Drinske divizije požrtvovano su krenule u juriš na Brdicu u "nepripremljenom i lakomisleno izvedenom noćnom napadu", na nepoznatom močvarnom zemljištu, bez podrške svoje artiljerije, lišene međusobnog sadejstva kolona, kidajući lopatama i bajonetima žičane prepreke, ali su doživele pravu katastrofu. Čitava dva dana su vođene teške borbe ali položaj nije zauzet, a gubici su bili ogromni, pa su dalji napadi prekinuti do dolaska pojačanja. Narodna enciklopedija (1927) navodi da su gubici srpske vojske bili: poginulo i nestalo 16 oficira i 475 vojnika, ranjeno i evakuisano 14 oficira i 606 vojnika, zarobljeno 4 oficira i 477 vojnika. Vojna enciklopedija (1970) navodi da su srpski gubici bili oko 1000 mrtvih, ranjenih i nestalih. Dr Borislav Ratković, urednik Vojnog leksikona (1981), navodi da su jedinice Drinske divizije izgubile blizu 1.800 ljudi, skoro petinu od ukupno poginulih u prvom balkanskom ratu (Srbija je izgubila 22.000 poginulih ili umrlih usled bolesti). Dok su pojačanja u vidu novoformiranog Primorskog kora stigla, Velike sile su u Londonu već definitivno odlučile da Skadar pripadne novoformiranoj Albaniji. Zbog ovoga se odustalo od daljih napada na Berdicu. ​Vau-Deja (albanisch auch Vau-Dejë, Vau-Dejës, Vau i Dejës) ist eine Gemeinde städtischen Typs (Bashkia) in Nordalbanien im Qark Shkodra. Die Gemeinde hat 30.438 Einwohner (Stand 2011). Ihr wurden 2015 die zuvor selbständigen Gemeinden Bushat (14.149 Einwohner), Hajmel (4430 Einwohner), Shllak (671 Einwohner), Temal (1562 Einwohner) und Vig-Mnela (1509 Einwohner) eingegliedert. Die Gemeinde Vau-Deja hatte im Jahr 2011 8117 Einwohner (Volkszählung 2011). Die Lokalbehörden gaben eine deutlich höhere Zahl von 12.312 Einwohnern (2008) an. Vau-Deja liegt rund zehn Kilometer südlich von Shkodra am Fluss Drin, der auch den Ortsnamen geprägt hat: Zu Deutsch bedeutet er Furt von Deja. Der Ort markiert den Übergang zwischen der albanischen Küstenebene – die Adria ist rund 20 Kilometer entfernt – und dem albanischen Bergland. Der Drin, Albaniens längster Fluss, tritt hier aus den Bergen und teilt sich in zwei Arme. Er wird bei Vau-Deja zum Vau-Deja-Seegestaut. Gleich unter der Staumauer schließt sich das Spathara-Staubecken an, das zur Energiegewinnung im Rahmen des Wasserkraftwerk Ashta genutzt wird. Die alte Gemeinde beastand aus einem städtischen Zentrum und acht Dörfern auf einer Fläche von 31 Quadratkilometern. Zentrum ist der Ortsteil Laç-Qyrsaçi, der gleich unterhalb der Staumauer am Südufer des Drin liegt und heute oft einfach Qytet (Stadt)genannt wird. Ein weiterer großer Ortsteil ist Mjeda, zwei Kilometer westlich von Laç. Die Siedlung Deja liegt gegenüber diesen beiden Orten nördlich des Drin am Fuße eines kleinen Hügels. Westlich davon liegt das Dorf Spathar ebenfalls am nördlichen Drin-Ufer beim gleichnamigen Staubecken. In der Ebene südlich von Mjeda verstreut finden sich die Dörfer Shelqet, Koça und Naraç. Im dünn besiedelten Hügelland östlich von Laç liegen die Dörfer Dush und Gomsiqa sowie schon fast am anderen Ende des Stausees Karma. Etwa die Hälfte der Bewohner der alten Gemeinde lebt in den Dörfern. Die neuen Gemeindeteile liegen zum Teil in der Zadrima-Ebene, zum Teil im östlich angrenzenden Bergland. Die Gemeinde hat eine Fläche von 468 Quadratkilometer. Die Dörfer Vig und Mnela liegen im Tal des Flusses Gjadër südöstlich von Vau-Deja. Das sehr abgeschiedene Cukali-Hochland nordöstlich von Vau-Deja umfasst das ehemalige Gebiet der Gemeinde Temal mit den Dörfern Koman, Malagji-Kajvall, Kllogjen, Toplana, Vila, Serma, Arra und Telum sowie der Gemeinde Shllak mit den Dörfern Kron i Madhë, Beneja, Ukbibaj, Barcolla, Vukjakaj-Gegaj, Palaj-Gushaj und Vukaj. Shllak war der westliche Teil von Cukali nördlich des Vau-Deja-Stausees, Temal schloss sich östlich an und liegt nordwestlich des Koman-Stausees. Das Dorf Hajmel liegt südlich von Vau-Deja im Norden der Zadrima. Zur Gemeinde Hajmel mit einem Gebiet von 30,6 Quadratkilometern gehörten auch die Dörfer Dheu i Lehtë, Pistull, Paçram und Nenshat. Bushat, der größte Ort der Region, liegt westlich von Vau-Deja. Zum Gemeindegebiet mit 92,7 Quadratkilometern zählten die Dörfer Bushat, Shkjeza, Plezha, Kosmaç, Stajka, Ashta, Rranxa, Fshat i Ri, Konaj, Melgushë, Mal i Jushit, Barbullush, Kukël und Hotnej. Geschichte[Bearbeiten | Quelltext bearbeiten]Die Römer errichteten in den Hügeln südöstlich bei Vig im 4. Jahrhundert ein Kastell, um die Straße nach Priština gegen ost- und westgotische Attacken zu schützen. Sarda (albanisch Shurdhahi) ist eine weitere römische Befestigung. Die auf einem Hügel gelegene Anlage – heute eine Insel im Stausee – wurde aber schon von den Illyrern genutzt. Die Besiedlung des schon fast städtischen Sardas dauerte an bis zur Eroberung Albaniens durch die Osmanen im 15. Jahrhundert. Kirche von Vau-Deja abgebildet auf der Rückseite der 1000-Lek-Banknote, herausgegeben 1997Im Jahr 1361 wurde in Vau-Deja eine Kirche errichtet, die zu den ganz wenigen nicht-byzantinischen, sondern romanisch-gotischen Gebäuden Albaniens zählt. Die mit Fresken ausgestattete Marienkirche wurde zerstört. Auf der mittelalterlichen Burg finden sich noch die Überreste einer Markuskirche aus dem 14. Jahrhundert. Die Furt von Vau-Deja, damals Dagno genannt, war in der vor der osmanischen Besetzung eine wichtige Zollstation. Skanderbeg führte ihretwegen Krieg mit Venedig. Im Jahr 1052 wurde in der Region das Bistum Sapa errichtet mit Sitz in Sapa (Burg des heutigen Nënshat etwas südlich) und später in Vau-Deja. Eine neu erbaute, Mutter Teresa geweihte Kathedrale befindet sich im Zentrum von Laç. Bodensenkungen oder Hochwasser in den Jahren 1858/59 führten dazu, dass die Mehrheit der Wassermassen des Drin sich einen neuen Weg suchte und seither nicht mehr nach Süden und bei Lezha ins Meer fließen, sondern weiter westlich bei Shkodra in die Buna münden. StaudammRund ein Drittel des alten Gemeindegebiets wird landwirtschaftlich genutzt. Ein Drittel der arbeitsfähigen Bevölkerung war im Jahr 2008 arbeitslos. Es gibt neun Grundschulen und zwei weiterführende Schulen. In den 1960er Jahren wurde mit dem Bau der Staudämme begonnen, später der See aufgestaut und 1975 das Wasserkraftwerk in Betrieb genommen. Das Wasserkraftwerk gehört zu den größten Stromlieferanten Albaniens. Das touristische Potenzial des landschaftlich schönen Vau-Deja-Sees wird noch kaum genutzt. Vereinzelte Restaurants und Bars, die auch Zimmer vermieten, sind an seinem Ufer entstanden. Die Möglichkeit, mit Boten die Insel Shurdhahi mit dem antiken Sarda zu besuchen, wird nur vereinzelt genutzt. Bei Touristen beliebter sind Bootsfahrten auf dem Koman-Stausee. Die Hauptverkehrsstraße SH 1 von Tirana nach Shkodra führt zwischen Bushat und Vau-Deja durch das Gemeindegebiet. Die albanische Eisenbahn Hekurudha Shqiptare verläuft weiter östlich bei Vau-Deja, wo sie den Drin quert; in Mjeda befindet sich ein Bahnhof. Zudem führen die Straßen nach Puka (SH 5) und Koman durch den Ort. Vau i Dejës naziv je hidroelektrane u Albaniji, na rijeci Drim. Nalazi se pored naselja Vau-Dejës. Ima 5 turbina kineske proizvodnje, svaka s nominalnim kapacitetom od 52 megavata. Ukupni kapacitet je 260 MW. Završena je 1973. godine. Trenutno je obnavlja hrvatska tvrtka Končar. 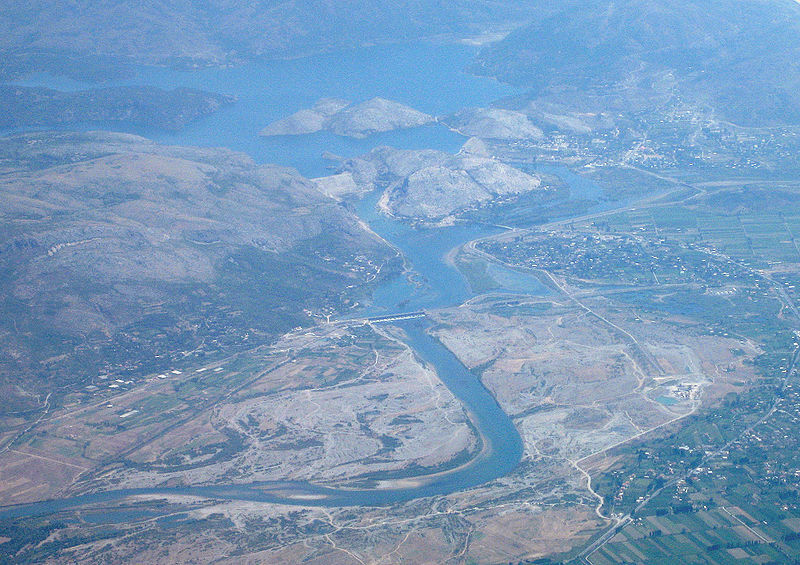 The Vau i Dejës Hydroelectric Power Station is a hydroelectric dam on the Drin River, in Albania, near Vau i Dejës. Completed in 1973, the project consists of five turbines of Chinese origin, each with a nominal capacity of 52 MW, totaling the installed capacity to 260 MW. ​Hidrocentrali i Vaut të Dejës nisi të ndërtohej më 1967 dhe u vu në shfrytëzim më tetor 1971. Ka digën e Zadrejës dhe një në Qyrsaq te ndertuara mbi kaskaden e lumit Drin. Këto diga krijojnë një rezervuar, (Liqenin e Vaut të Dejës) me vëllim 580 milionë metër kub ujë. Church of Vau i Dejes is depicted on the back of the 1000 Lek banknote, issued in 1997. Poznato je po bivšoj zrakoplovnoj bazi, posebo u razdoblju Hladnog rata. According to Report of a Visit to Parts of Turkey, Bar, Albania and Serbia (written by Marin Bici, Archbishop of Antivari) Gjadër, at the time, was a village of about eighty houses, the vast majority of which were inhabited by Roman Catholics, while two or three houses were inhabited by Muslims. 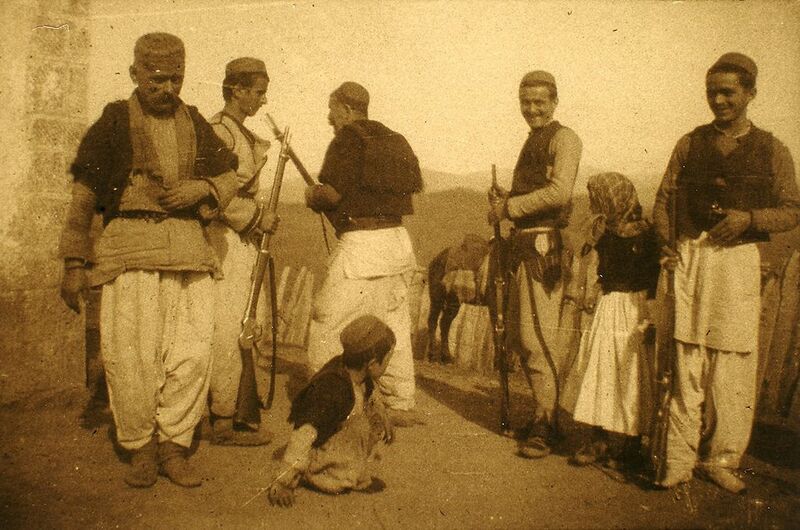 According to the 1890 register of the Roman Catholic Diocese of Sapë Gjadër at that time had a population of 438 people consisting of 388 Catholics and 50 Muslims. Gjon Gazulli (Latin: Johannes Gasulus)[a][b] Gjadër, Republic of Venice, 1400 – Dubrovnik, 19 February 1465) was an AlbanianDominican friar, humanist scholar, and diplomat. LifeGazulli attended schools in Shkodër and Ragusa, and in 1425 he graduated from University of Padua. In 1432 he traveled to the Hungarian royal court where he attempted to persuade Sigismund I in supporting Albanian resistance against the Ottoman Empire. He broke his mission off in 1433, when he was appealed to be a professor of mathematics and astronomy at the University of Padua. Years later he was acting as a diplomat with the Italian principalities' courts, representing the interests of Skanderbeg and of the League of Lezhë. His lasting mathematical and astronomical works were written in Latin. He was renowned for his considerable knowledge, in Italy and in Hungary, as well. His brother, Pal Gazulli(1405–1470) was the diplomat of Skanderbeg and of the League of Lezhë in Ragusa. He had a second brother named Andrea Gazulli, also mentioned as prominent. Notesa. ^ Also known in Albanian as Gjon Gjin Gazulli, or even Gjin Gazulli. In Croatian he is as Ivan Gazulić, Ivan Gazul and Ivan Gazoli > In Serbian he is known as Jovan Gazulić. b. ^ Not to be confused with Dom Gjon Gazulli, an Albanian Catholic Cleric, executed by Ahmet Zogu's regime in 1927. Ivan Gazulić, Ivan Gazul, lat. Johannes Gazulus, alb. Gjin Gazulli., Gjon Gazulli (oko 1400. - Dubrovnik, 19. veljače 1465. ), hrvatski astronom i diplomat iz Dubrovnika. Redovnik dominikanac albanskog podrijetla. Bavio se i astrologijom.Humanist važan kao matematičar. ​Životopis[uredi VE | uredi]Završio je školu u Skadru [nedostaje izvor] i Dubrovniku gdje je stupio u dominikanski red. U dubrovačkom je dominikanskom samostanu živio i radio. Djelovao diljem Europe. Kao intelektualac skupljao je knjige još za studija u Padovi gdje je doktorirao 1430. godine filozofiju. Svoje je knjige oporukom ostavio u dubrovačkoj katedrali uz uvjet da se zbirku ne smije dijeliti nego mora ostati cjelovita i dostupna svima. Tako je postao osnivač dubrovačke javne knjižnice, što mu je bila namjera. Zbirka sadrži gramatička, retorička, poetska (diversa volumina librorum spectantia ad facultatem grammaticalem, rhetoricam et poeticam), teološka i djela o kanonskom pravu. Glas uglednog astrologa doveo je 1459. do poziva hrvatsko-ugarskog kralja Matije Korvina Ivanu Gazulu za mjesto dvorskog astrologa, što Gazul nije prihvatio. Gazul je tvorac metode kojom je podijeljeno nebo na nebeske kuće. Metoda se naziva Gazulli-Campanova metoda, a Gazulov udio u toj metodi je računska razrada Campanusovog postupka podjele neba na te kuće, vrlo bitni dio horoskopa. Bila je poznata u dva velika europska grada. Utjecala je na jedan jednostavniji postupak određivanja nebeskih kuća, tzv. Regiomontanusov postupak. Službovao kao diplomat Dubrovačke Republike. Posrednik u bitnim i osjetljivim diplomatskim poslovima za cara Žigmunda u talijanskim krajevima, zatim u Tarantu na kneževskom dvoru, kod slavonskog bana Matka Talovca te kod papa u Rimu, pape Eugena IV. i Nikole V.. Tijekom 1432. godine posjetio je dvor kralja Žigmunda Luksemburškoga kao izaslanik albanskih pobunjenika tražeći pomoć u borbi protiv Osmanskoga Carstva. Od 1433. je radio kao profesor u Padovi, a kao diplomat zastupao interese Dubrovačke Republike, Skenderbega, koji je vladao jednom kneževinom na teritoriju, koji danas pripada Albaniji. Zastupao interese Lješke lige. Njegov brat Pavao Gazulić (Pal Gazulli) također je bio diplomat u službi kod Skenderbega i Lješke lige. Dokumenti spominju i drugog Ivanovog brata, Andriju (Andrea Gazulli) kao prominentnog. Utjecajan astronom. Jan Panonij (Ivan Česmički, Jan Panonac) molio je Ivana u pismu da mu pošalje neke astronomske sprave ("Ptolomejeve prstene"), što kazuje da ih nije bilo lako nabaviti u Ugarskoj, niti ih je tko znao ondje napraviti. Autor više astronomskih rasprava. Služio se astronomskim naspravama koje je sam izradio ili naručio kod dubrovačkih majstora. Poznato Gazulićevo astronomsko djelo je De astrolabii utilitatibus (O koristi astrolaba). Kao matematičar bio u kontaktu s velikim brojem svjetskih znanstvenika, posebice onodobnih matematičara i astronoma. Polemizirao je s matematičarem i liječnikom Johannesom Müllerom Königsbergerom (Regiomontanus, 1436.-1476.). Regiomontanus ga stavlja u isti red s filozofom, teologom i prirodoslovcem, kardinalom Nikolom iz Cuesa. Gazulić je svoja djela slao učenim ljudima koji su bili u krugu kralja Matije Korvina, gdje su Hrvati bili najvažnije ljudstvo, poput velikovaradinskog biskupa i mađarskog primasa Ivana Viteza od Sredne te rečenog Ivana Česmičkog, pečuškog biskupa i hrvatskog bana, inače Vitezovog nećaka. Počevši od 1433. godine bio je profesor matematike i astronomije na Sveučilištu u Padovi. Poznati hrvatski knjižničar Šime Jurić uvrstio ga je u svoju zbirku zaboravljenih hrvatskih latinista (uz njega su uvršteni Dobrić Dobrićević, Matija Vlačić Ilirik, Franjo Niger, Frane Petrić, Šimun Hvaranin). Ne valja brkati Ivana Gazulića (Gjona Gazullija) s istoimenim albanskim katoličkim svećenikom Dom Gjonom Gazulijem kojeg je smaknuo režim Ahmeta Zogua 1927. godine..
​Jovan Gazulić (lat. Johannes Gasulus, albanski: Gjon Gazulli) (1400, Gjader, Oblast Leš, Mletačka Republika - 19. februar 1465. Dubrovačka Republika) je bio sveštenik dominikanskog reda, profesor matematike i astronomije i diplomata. Završio je školu u Skadru i Dubrovniku, a 1425. diplomirao na Univerzitetu u Padovi. Tokom 1432. godine posetio je dvor kralja Žigmunda Luksemburškog kao izaslanik albanskih pobunjenika tražeći pomoć u borbi protiv Osmanskog carstva. Počev od 1433. godine je bio profesor matematike i astronomije na Univerzitetu u Padovi a istovremeno je kao diplomata zastupao interese Dubrovačke Republike i Skenderbega koji je vladao jednom kneževinom na teritoriji koja danas pripada Albaniji. Njegov brat Pavel Gazul je takođe bio diplomata u službi kod Skenderbega. Das in Albanien gelegene Bistum Sapa (lat. : Dioecesis Sappensis, Albanisch: Dioqeza e Sapës) wurde im Jahre 1062 begründet und ist ein Suffragan des Erzbistums Shkodra-Pult. Es erstreckt sich entlang des Unterlaufs des Drin südlich der Stadt Shkodra. Bischofssitz ist der Ort Vau-Deja im Kreis Shkodra. ​Biskupija Sapa (lat. Dioecesis Sappensis) je rimokatolička biskupija u Albaniji. Jedna je od šest biskupija u Albaniji. Nalazi se u blizini Skadarskog jezera, u slivu rijeke Drima. Ime je dobila po gradu Sapi, koji se nalazi na uz rijeku Drim u njenom doku, jugoistočno od Skadarskog jezera. Vjerojatno je bio pogranična utvrda. Uspostavio ju je 1062. papa Aleksandar II..
U starije vrijeme, u 11. stoljeću se nalazila u Duklji . Ima oko 100 tisuća vjernika u 29 župa. Druga je po veličini u Albaniji. Sjedište biskupije je mjesto Vau-Dejes. U doba prije turske vlasti sjedište je bilo u naselju Nënshat, u kojem se nalazio samostan i sjemenište. Dolazak komunista na vlast je bio donio teška vremena za ovu biskupiju. Enver Hoxha je oštro nametao radikalni ateizam, a posebno je na udaru bila katolička crkva. Tako su u ovoj biskupiji sjemenište u Nënshatu Hoxhini komunisti dali zatvoriti 1946., a biskupsku kuriju zatvoriti. Iako su vjernici odbili zahtjev vlasti za rušenjem crkve, režim je zatvorio i opustošio crkvu. Vrhunac progona je bilo okrutno ubojstvo biskupa Gjergja Volaja 1968. Blinisht is a village and a former municipality in the Lezhë County, northwestern Albania. At the 2015 local government reform it became a subdivision of the municipality Lezhë. The population at the 2011 census was 3,361. Blinisht (albanisch auch Blinishti) ist ein Dorf im Norden der Gemeinde Lezha in Nordalbanien. Der Ort liegt in der Zadrima-Ebene, die vom Altlauf des Drin durchzogen wird. Der Kreishauptort Lezha liegt rund zwölf Kilometer südlich, Shkodra rund 25 Kilometer nördlich und das Adriatische Meer – getrennt von zwei Hügelzügen – nicht ganz zehn Kilometer südwestlich. Bis 2015 war Blinisht eine eigenständige Gemeinde (komuna), die dann mit den anderen Gemeinden des Kreises Lezhazusammengelegt wurde. Die alte Gemeinde hatte eine Fläche von 38 Quadratkilometern und laut Volkszählung von 2011 3361 Einwohner. Die Lokalbehörden geben rund 5700 Einwohner an. Die Region ist sehr ländlich geprägt. Nebst dem Hauptort Blinisht, wo etwas mehr als Tausend Personen leben (2011), gehörten auch noch die sechs Dörfer Troshan, Fishta, Krajna, Piraj, Baqëlund Kodhel zur Gemeinde respektive zur heutigen Verwaltungseinheit Blinisht. Diese Dörfer liegen alle im östlichen Teil der Ebene oder am unteren Hangfuss. Einwohner Blinishts um 1905 auf einer Aufnahme von Franz NopcsaBlinisht gehört zur Zadrima, eine fruchtbare Ebene, die als katholisches Gebiet auch eine ethnographische Region darstellt. Die Pfarrei von Blinisht – damals Blijnisti – wurde im 17. Jahrhundert von Frang Bardhi als reichste und größte Albaniens beschrieben. Er bezeichnete Blinisht als großes Dorf, das seinen Reichtum den 150 christlichen Familien verdanke. Auch in Troshan befand sich damals eine der neun Kirchen der Zadrima. 1639 wurde in Blinisht eine der ersten Schulen Albaniens eröffnet, in der Franziskaner erstmals auch Unterricht auf Albanisch hielten. Im Dorf Fishta wurde 1871 der Franziskaner Gjergj Fishta geboren, der wohl bedeutendste Poet Nordalbaniens. Heute steht in Blinisht wieder eine neue, große Kirche. 2011 gaben bei der Volkszählung 95,98 % der Einwohner der Gemeinde an, katholisch zu sein. Ganz im Westen des Gemeindegebiets verläuft die Schnellstraße Lezha–Shkodra (SH1). Seit ihrem Bau kurz nach dem Jahr 2000 ist die zuvor schwer zugängliche Region besser erschlossen. Beim Dorf Baqël befindet sich eine Haltestelle der Albanischen Eisenbahn. Das Toponym leitet sich von der Baumgattung der Linden (albanisch: bli) ab, die in dieser Region häufig auftritt. Postleitzahlen vom Kreis Lezha. In: Geopostcodes.com. Abgerufen am 6. März 2013. ↑ Hochspringen nach:a b c Komuna Blinisht. In: Këshilli i Qarkut Lezhë. 17. April 2012, archiviert vom Original am 5. November 2012; abgerufen am 5. März 2013 (albanisch). ; vgl. auch Njësia Adm. Blinisht. In: Këshilli i Qarkut Lezhë. Abgerufen am 2. April 2018 (docx, albanisch). Hochspringen↑ Ines Nurja: Censusi i popullsisë dhe banesave / Population and Housing Census – Lezhë 2011. Rezultatet Kryesore/Main Results. Hrsg. : INSTAT. Pjesa/Part 1. Adel Print, Tirana 2013 (gov.al [PDF]). Hochspringen↑ Komuna Blinisht. In: Shoqata e Komunave te Shqiperise. Archiviert vom Original am 15. Oktober 2013; abgerufen am 5. März 2013 (albanisch). Hochspringen↑ Robert Elsie: Historical Dictionary of Albania. The Scarecrow Press, Lanham 2004, ISBN 0-8108-4872-4, S. 495. Hochspringen↑ Frang Bardhi: A Description of Zadrima. 1641. In: Texts and Documents of Albanian History. Robert Elsie, abgerufen am 10. Oktober 2016 (englisch). Hochspringen↑ The Catholic Church in Albania. In: Albanian Catholic Information Center (Hrsg. ): Albanian Catholic Buletin. Volume V, Nr. 1 & 2, 1984, ISSN 0272-7250, S. 4–25 (Online[PDF; abgerufen am 6. März 2013]). Hochspringen↑ Religious composition of Albania 2011. Abgerufen am 9. Mai 2017. ​Fishta (albanisch auch Fishtë) ist ein Dorf im Norden der Gemeinde Lezha in Nordalbanien. Der Ort liegt am östlichen Rand der Zadrima-Ebene. Die Einwohnerzahl wird mit etwa 200 angegeben. Bis 2015 gehörte Fishta zur Gemeinde Blinisht, einem Dorf rund drei Kilometer weiter westlich. Die Gemeinde (komuna) wurde damals mit den anderen Gemeinden des Kreises Lezha zusammengelegt wurde. In Fishta wurde 1871 der Franziskaner Gjergj Fishta geboren, der wohl bedeutendste Poet Nordalbaniens. Sein Geburtshaus am Südrand des verstreuten Dorfes ist heute ein Kulturdenkmal. Im Gegensatz zu den Nachbardörfern Blinisht im Westen und Troshan im Süden erwähnen die Verzeichnisse aus dem 19. und frühen 20. Jahrhundert weder das Dorf noch eine Kirche. Heute steht etwas südwestlich des Dorfzentrums neben der Grundschule ein Kirchenneubau. Im Südosten des Dorfes befinden sich zwei kleine Stauseen zur Bewässerung. Im Osten steigen die nördlichen Ausläufer des Skanderbeggebirges bis auf 624 m ü. A. an. Während des kommunistischen Regimes befand sich in Fishta ein Gefängnis, und zahlreiche Familien wurden hier interniert. Eine Asphaltstraße verbindet das Dorf über Blinisht mit der Schnellstraße Lezha–Shkodra (SH1). Eine weitere asphaltierte Straße führt von Vau-Deja durch die Dörfer der östlichen Zadrima nach Lezha. Beim Dorf Baqël etwas westlich von Fishta befindet sich eine Haltestelle der Albanischen Eisenbahn. Hochspringen↑ Pëllumb Sulo: Fshati i Gjergj Fishtës, ruan dëshmi të jetës së birit të saj. 5. November 2014, abgerufen am 19. Januar 2017 (albanisch). Hochspringen↑ Engelbert Deusch: Das k.(u.)k. Kultusprotektorat im albanischen Siedlungsgebiet in seinem kulturellen, politischen und wirtschaftlichen Umfeld (= Zur Kunde Südosteuropas. Band II/38). Böhlau, Wien 2009, ISBN 978-3-205-78150-9, S. 94 f. und 203 f.
Hochspringen↑ Teki Selenica: Shqipria më 1927. L'Albanie en 1927. Shtypshkronja Tirana, Tirana 1928. Hochspringen↑ pitture: Kisha e engjejve e Shkolla Fillore. 28. Mai 2011, abgerufen am 19. Januar 2017 (Foto). Hochspringen↑ Elvis Hila: Lezhë - „Ringjallja e Fishtës“. In: Ora News. 18. August 2016, archiviert vom Original am 19. Januar 2017; abgerufen am 19. Januar 2017. Info: Der Archivlink wurde automatisch eingesetzt und noch nicht geprüft. Bitte prüfe den Link gemäß Anleitung und entferne dann diesen Hinweis. Gjergj Fishta, rođen u Zadrimi, bio je albanski pjesnik, franjevac, borac za nacionalna prava, rilindas (rilindas = aktivist Albanskog nacionalnog pokreta - Rilindja Kombëtare) i prevoditelj. Predsjedao je komisijom na Kongresu u Monastiru, koja je odobrila albanski pravopis. Godine 1921. postao je potpredsjednik albanskog Parlamenta. 1937. godine dovršio je i objavio svoje epsko remek-djelo Planinska svirala (Lahuta e Malcís). 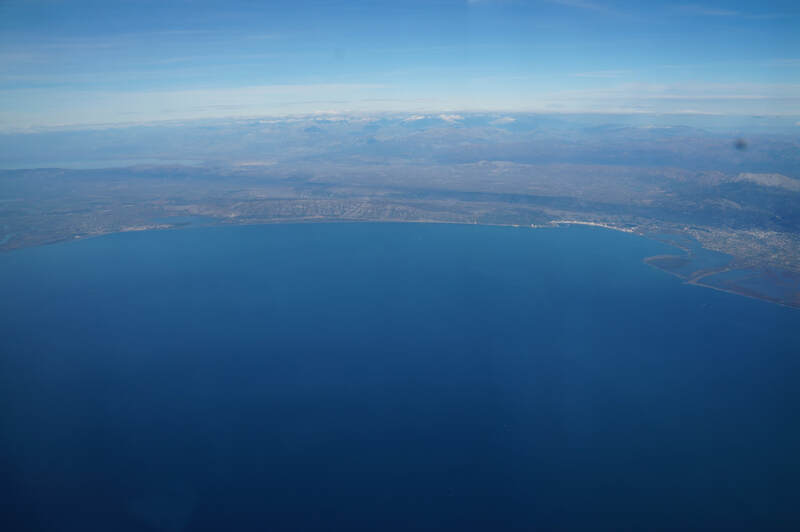 The Gulf of Drin or Drin Bay (Albanian: Gjiri i Drinit or Pellgu i Drinit) is an ocean basin of the Adriatic Sea within the Mediterranean Sea in the northern coast of Albania. Roughly in shape of a scythe, it extends immediately from the Delta of Buna in the north, across the port city of Shëngjin, to the Cape of Rodon in the south. The shoreline of the gulf is a shallow combination of sandy beaches, sand dunes, capes, salty and fresh water wetlands, estuaries, pine and coastal forests, reed beds and coastal meadows. The shoreline of the gulf has a length of approximately 60 kilometres and is spotted of cliffs and beaches fed by fluvial imputes. The region is drained by numerous rivers and has formed a characteristic ecosystem and biodiversity. It is named after the Drin River that runs through a mountainous area towards the coast, however, the Ishëm and Mat drains into the gulf. In consideration to the flat landscape, the gulf's shoreline are dotted with extensive wetlands and lagoons that continuously change in size and shape. The biodiversity of the gulf is relatively high and several protected areas have been established along the coasts amongst them the Buna River-Velipoja Protected Landscape in the north, Kune-Vain Nature Reserve in the centre and Patoku-Fushë Kuqja Nature Reserve in the south. It is also classified as an Important Bird and Plant Area, because it supports numerous bird and plant species.The region lies mainly within the catchment area of the Drin that is officially recognized as an important biodiversity hotspot. The gulf is one of the most important places in the Adriatic Sea for sea turtles. Its beaches are nesting and foraging grounds for 2 important and endangered species of sea turtles including the green sea and loggerhead sea turtle. Apart from the famous endangered sea turtles, which are to be found in almost all the coasts, it hosts whales such as the cuvier's beaked whale and dolphinsamongst them the striped dolphin, risso's dolphin and common bottlenose dolphin. Der Drin-Golf (albanisch Gjiri i Drinit oder Pellgu i Drinit) ist eine Meeresbucht im südöstlichsten Teil der Adriaentlang der Küste Nordalbaniens. Die Küstenlinie des Drin-Golfs erstreckt sich von der Mündung der Buna, dem Grenzfluss zwischen Montenegro und Albanien, bis zum Kepi i Rodonit nördlich von Durrës. Die Distanz zwischen diesen beiden Punkten beträgt 30 Kilometer; die Küstenlinie ist über 60 Kilometer lang. Die Bucht ist hauptsächlich seicht. Die zentralen Gebiete sind meist tiefer als 30 Meter, die tiefsten Stellen aber lediglich 42 Meter tief. Der Untergrund besteht vornehmlich aus Schlamm und Sand. Die Wassertemperatur beträgt im Februar durchschnittlich 1,8 °C, im August 23,4 °C. Luftaufnahme des südlichen Bereichs der Bucht mit Patok-Lagune und Mat-MündungNördlicher Teil des Drin-Golfs von Ada Bojana bis zur Drin-MündungMehrere große Flüsse aus den albanischen Bergen strömen in den Drin-Golf: Im Süden der Ishëm, etwas nördlich der Mat. Der namensgebende Drin fließt heute zum größten Teil in die Buna – der Altlauf Drini i Lezhës, der direkt ins Meer mündet, führt nur noch wenig Wasser. Der südliche Teil des Golfs zwischen Mat-Mündung und Kepi i Rodonit wird auch Gjiri i Rodonit (Rodon-Bucht) genannt. Abgesehen vom Hügelzug, dessen äußere Spitze vom Kepi i Rodonit gebildet wird, und einem weiteren Hügelzug längs des nordöstlichen Ufers, ist die Küste des Golfs flach, geprägt von ausgedehnten Feuchtgebieten mit Lagunen. Die Lagune von Patok liegt südlich der Mat-Mündung bei Fushë-Kuqja, das Feuchtgebiet von Kune-Vain an der Drin-Mündung und ein weiteres Feuchtgebiet östlich der Buna-Mündung bei Velipoja. Über weite Gebiete ist die Küste deshalb unzugänglich, auch wenn die Küstenebene außerhalb dieser Feuchtgebiete seit Mitte des letzten Jahrhunderts trockengelegt ist. Im nördlichen Bereich zieht sich über mehrere Kilometer ein Hügel (561 m ü. A.) entlang der Bucht, dessen seeseitiges Ufer nicht erschlossen ist. Hier findet sich am Hang des Mali i Rencit die Sanddüne Rëra e hedhur (auch Rana e hedhun). Shëngjin ist der einzige Hafen am Drin-Golf. Es existiert dort eine weitere kleine Bucht, Gjiri i Shëngjinit. Der Hafen dient als Marine-Basis. Zudem wird dort Erdöl umgeschlagen, und einigen Fischern dient er als Basis. In seichtem Wasser wird oft auch mit Reusen gefischt. Gefischt werden rund 60 Arten. Auch Suppenschildkröten und vor allem Karettschildkröten nutzen den Golf bei der Futtersuche und gehen bei Patok auch an Land. Die Lagunen sind alle bedeutende Feuchtgebiete, die von zahlreichen, zum Teil seltenen Zugvögeln als Rastplatz oder zur Überwinterung genutzt werden. Shëngin und Velipoja haben sich in den letzten Jahren zu bedeutenden Badeorten entwickelt. Entlang der langen Sandstrände sind zahlreiche Hotelanlagen entstanden, wo sich im Sommer insbesondere Albaner aus dem Inland und aus Kosovo erholen. Die dem Golf zuführenden Flüsse sind mehrheitlich stark verschmutzt. Ihre schlechte Wasserqualität und Müll – insbesondere Plastik – bedrohen auch die ganze Bucht. Vor allem der Ishëm führt – weil er von der Hauptstadt Tirana herkommt – der Bucht viel Zivilisationsmüll und stinkendes Wasser zu. Sipërfaqe 23,027 ha, Gjatësia e lumit Buna është rreth 44 km, ndërsa rënia vetëm 1,2 m/km. sipërfaqe të tjera (toka bujqësore, zona të banuara) - 14 134 ha. pjesa qendrore e kënetave të Domnit dhe të Murtemzës. Mesatarja vjetore e reshjeve - 1600-1800 mm. Zona ka 280 – 300 ditë me diell për vit. Vegjetacioni dhe FloraNe kete zone flora eshte shume e pasur, populus, salix, pinus, fraxinus, alnus, paliurus, nimphea alba phragmites,juncus etj vlen te permedim nje specie e rralle qe eshte Querqus robur e cila eshte ne rrezik zhdukje. Bimësi pyjore në kuptimin e mirëfilltë, gjejmë në brigjet e lumit në Rezervatin e Velipojës, Ishullin Ada dhe Franc Jozef, në fshatrat Reç, Sutjel, Shënkoll dhe në ishullin e Bahçallekut. Bimësia e këtyre sipërfaqeve pyjore përbëhet kryesisht nga disa lloje plepash, shelgjesh, frashëri, dushqesh e gjithashtu nga rrushkulli, akacia, thana, shkoza, marina, etj. Fauna e “Lumi Buna-Velipojë”Lumi Buna, Rezervati i Velipojës, Këneta e Domnit, Laguna e Vilunit, janë plot me shpendë. Numri i specieve dhe individëve: Numri më i madh i specieve është 47 specie. Numri më i madh individëve e kanë specie Fulica atra (1089) dhe Larus ridibundus (319). Statusi i specieve sipas IUCN: Statusi sipas IUCN 2015 i specieve të shpendëve të numëruara gjatë 2004 – 2015 (aspekti dimeror) në Zonën e Mbrojtur të Lumit Buna (Shqipëri) janë 59 specie (nga totali prej 61 speciesh). 216 lloje të faunës me status kombëtar dhe 36 lloje të faunës me status global (Laguna e Vilunit). Ligatina është një strehë për shpendët migratorë të detit dhe tërheq shumë lloje zogjsh si Kryekuqe, Rosa, Bajzat, Kredharak, Karabullaku, Cafka. Zona është gjithashtu një mjedis i rëndësishëm ushqimi dhe migrimi për pelikanët dalmate. Në pyll jetojnë kafshë të shumta të egra: lepuri, çakalli, derri i egër, fazani etj. Në derdhje të Lumit Buna, në thellësi deri 40 m në det, janë gjetur 66 specie peshqish. Speciet më dominante: Mullus barbatus barbuni, Merluccuis merluccius merluci, Spicara smaris maridha, Citharus linguatula paroshja, Lepidotrigla cavillone peshk gjel luspëmadh, Solea solea gjuhëza, Torpedo torpedo peshk elektrik. Njihen 8 specie peshqish që zhvillojnë migrime biologjike në rrugët Deti Adriatik ↔ Lumi Buna + Liqeni i Shkodrës. Mugil cephalus qefulli i verës, Liza ramado qefulli i vjeshtës, Anguilla anguilla ngjala dhe Alosa fallax kubla migratore janë specie me rëndësi për peshkimin. Tursiops truncatus Delfini turishishe preferon brigjet e detrave dhe deltat e lumenjve. Në prodeltën e Lumit Buna delfinët janë parë 8 të tillë, ndërsa përgjatë lumit janë parë 12 të tillë, në stinët e ngrohta. Caretta caretta Breshka e detit e gjetur në Lumin Buna afër Muriqanit. Kjo specie breshke vjen brigjeve ranore të detit për të depozituar vezët, por ky rast është i rralle ne Lumin Buna, 7 km afër Shkodrës. Shëngjin (srp. Sveti Jovan ili Sveti Jovan Medovski, talij. San Giovanni di Medua, ponekad samo Medova / Medovo) je primorski lučki i turistički grad na obali Jadranskog mora i središte istoimene općine u Lješkoj oblasti.